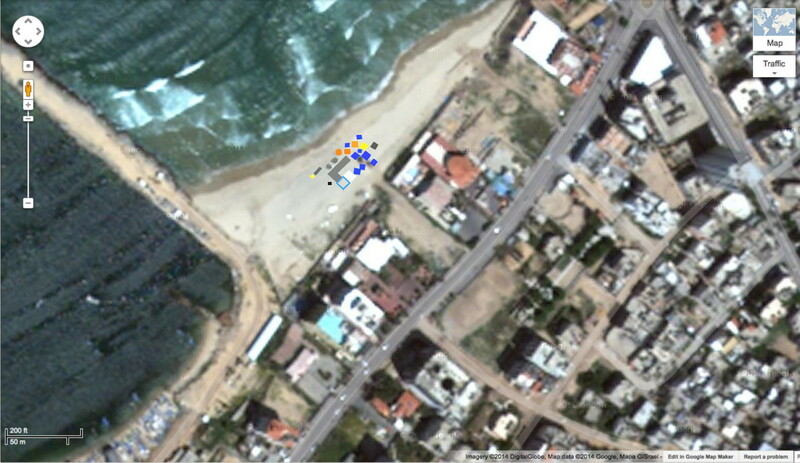 Several people have asked me if I could create a timeline for the Hamas Gaza beach operation that killed Mohammed Bakr, Ahed Bakr, Zakaria Bakr, and Ismail Bakr on July 16, 2014. The Wall Street Journal confirmed my suspicions that this was a hoax, but that information was immediately buried. I found it only on October 15, 2014. I’ve deliberately included all the contradictory statements from the press in order to show you how utterly corrupt western media is. They’re unindicted co-conspirators in Hamas operations. I know these accounts make the story more confusing, but I’m simply repeating what the press said, in order to show you that their version of events is totally wrong. 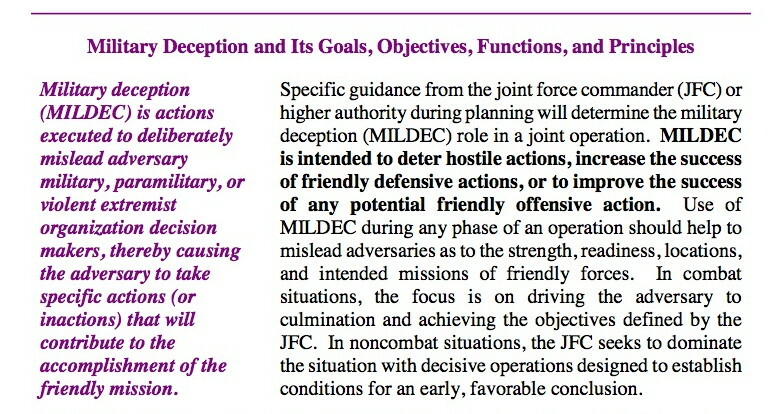 This is not a “conspiracy theory.” It’s a completely plausible military deception (MILDEC) operation. Here’s a map that shows the relevant buildings and locations. I added the tents and other structures that were present on July 16, 2014. 1. 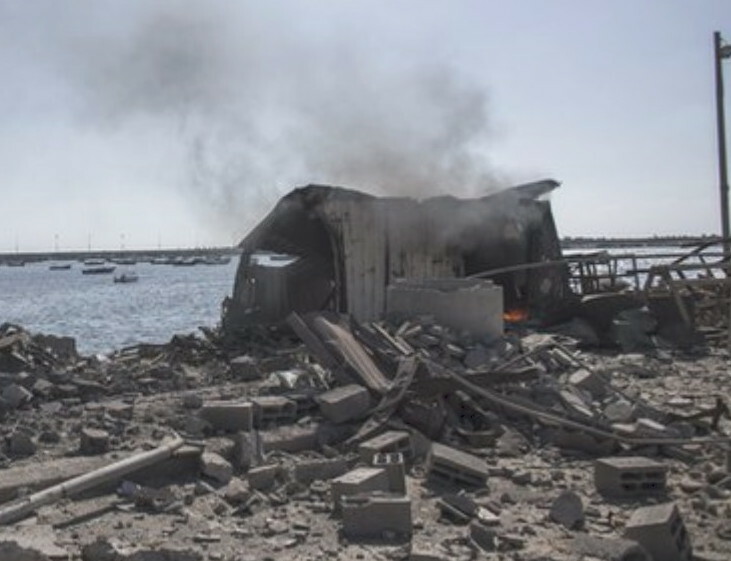 On July 10, 2014, at around 2:00 a.m., the IDF destroyed most of a Hamas Naval Police post on the breakwater in Gaza harbor, shown here in a photo from May. The white shipping container on the right remained mostly intact. 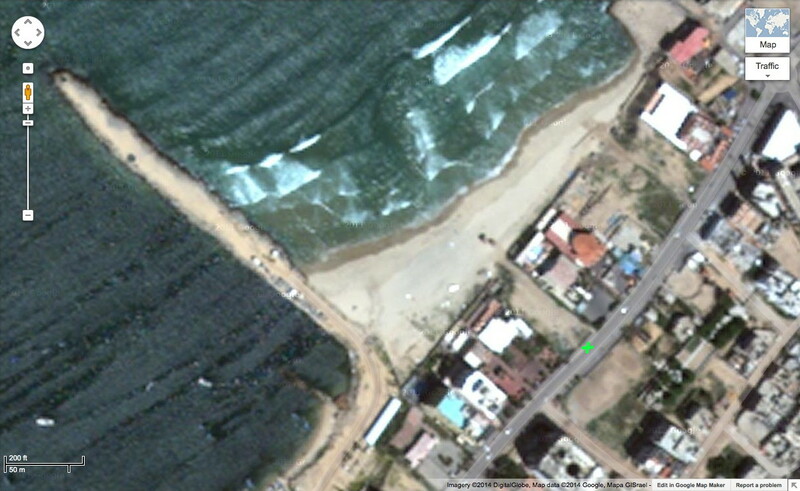 This breakwater is in fact a Hamas compound used by terrorist naval commandos. 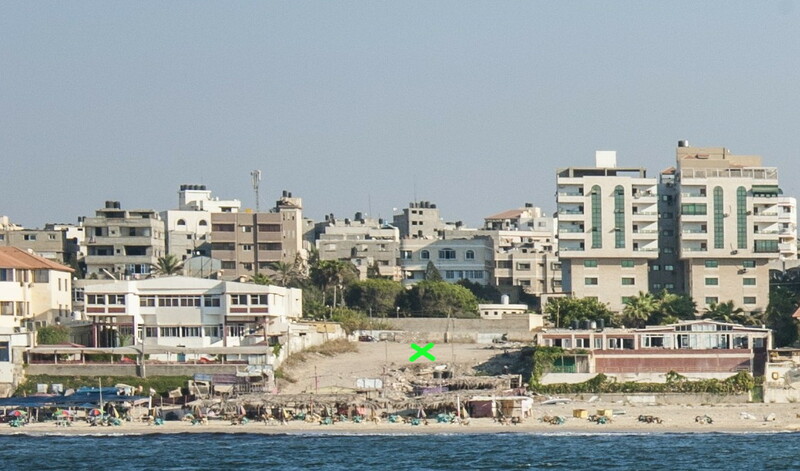 You can see that the steel shipping container and the main police post have stanchions and steel hoops over their tops, which allowed Hamas to cover them with tarpaulins. 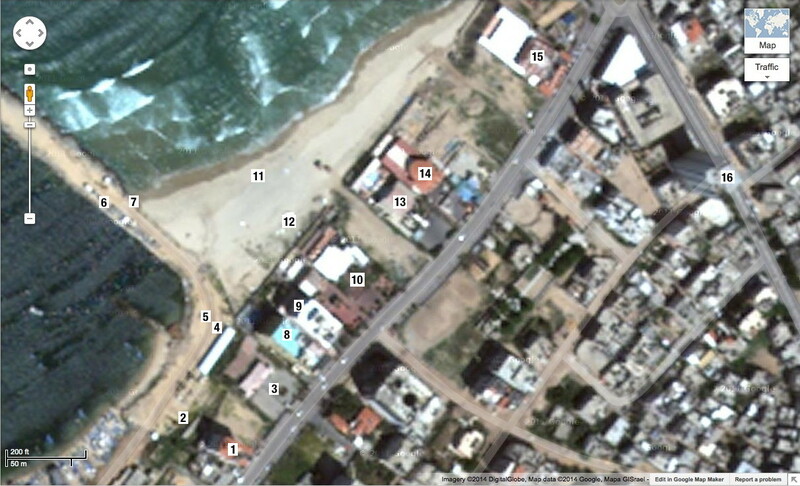 Hamas uses such coverings—as well as tents—to conceal rocket launchers and terrorist activities from aerial surveillance. Sometime before May of 2014, the police post was repainted. 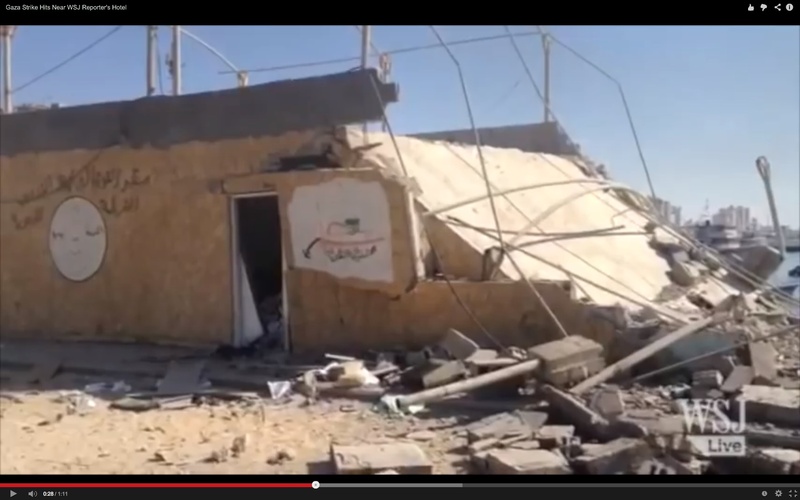 Western journalists were told that the structure was a restaurant. This indicates that Operation Four Little Martyrs was months if not years in the planning. It went forward despite the destruction of the post. 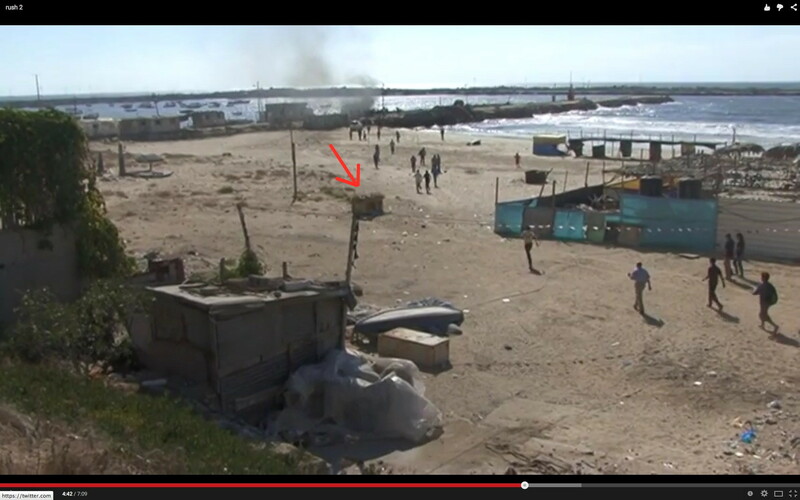 After the Israeli attack of July 10, 2014, one end of the surviving shipping container was open. Hamas later covered this opening to make the structure look like a fisherman’s hut. At least three sheets of corrugated metal were used. 2. 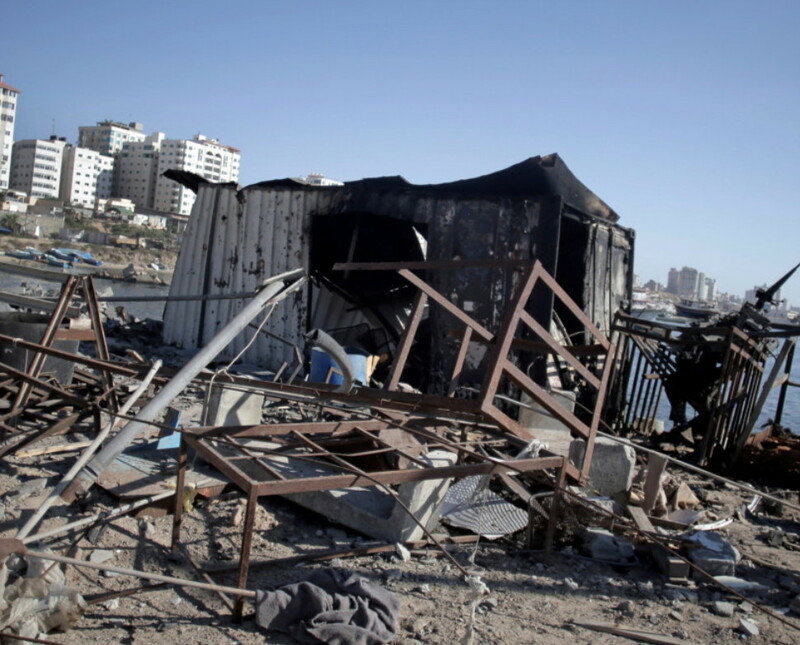 Hamas set in motion a plan to lure the IDF into firing a missile at the shipping container. Four boys and two men were chosen to be martyrs. The boys were members of a powerful family prominent in the Fatah Party. They weren’t the ragged children of humble fishermen, as the press—stenographers of terrorists—tells us. 3. 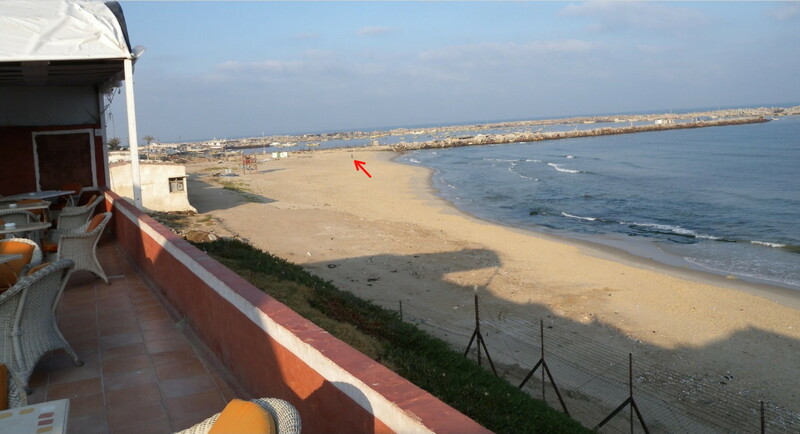 Around July 10, 2014, photos of the the beach were taken from the al-Ghifari Tower. Photographers at 24 Media Production Company began creating composite images that would depict four boys running from the breakwater and being killed by an Israeli munition. 4. 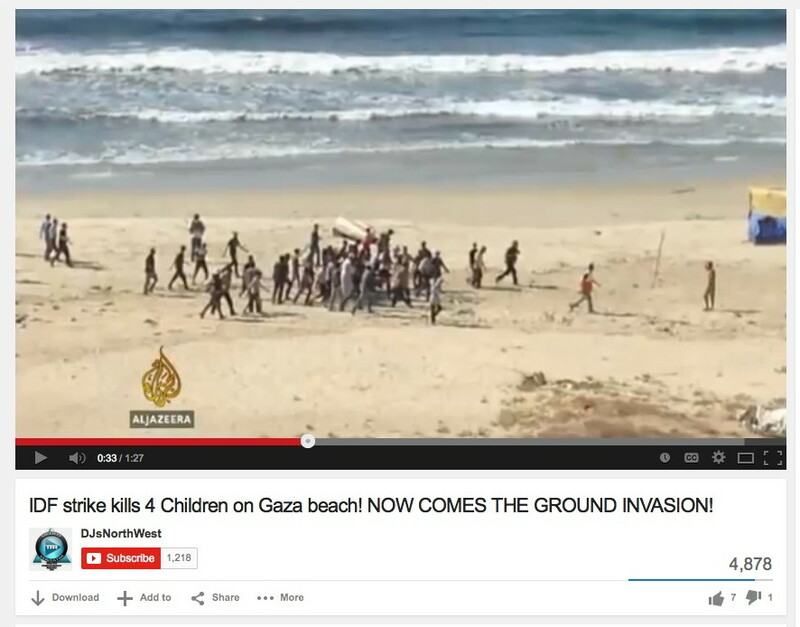 At around 2:00 p.m. on July 15, 2014, Palestinians photographed and videotaped Mohammed Bakr, Ahed Bakr, Zakaria Bakr, and Ismail Bakr running on the beach. These images were later passed off as having been taken July 16, 2014.We know they’re fake because the steel shipping container was not burning. All photos and video taken on July 16, 2014, shows that the shipping container belched smoke for hours. 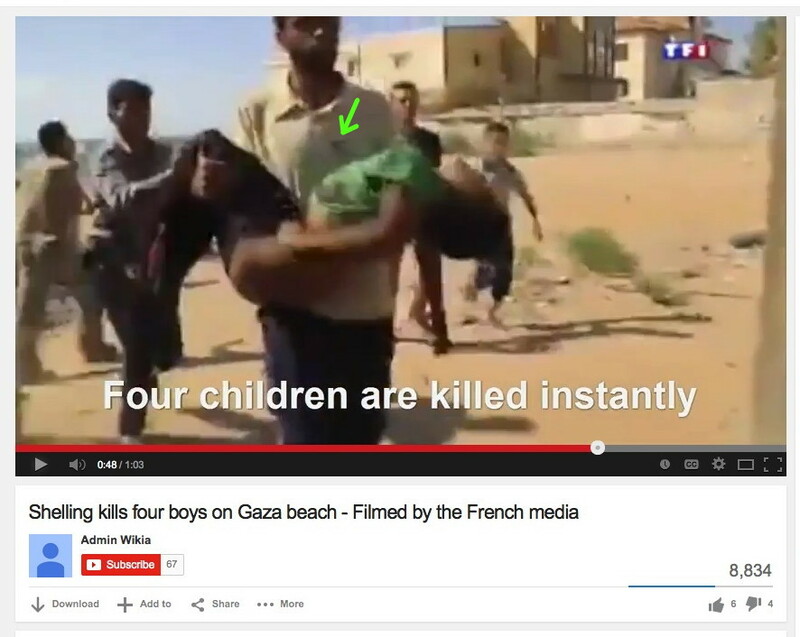 In reality Hamas murdered the four boys on the afternoon of July 15 and hid their bodies on the beach. 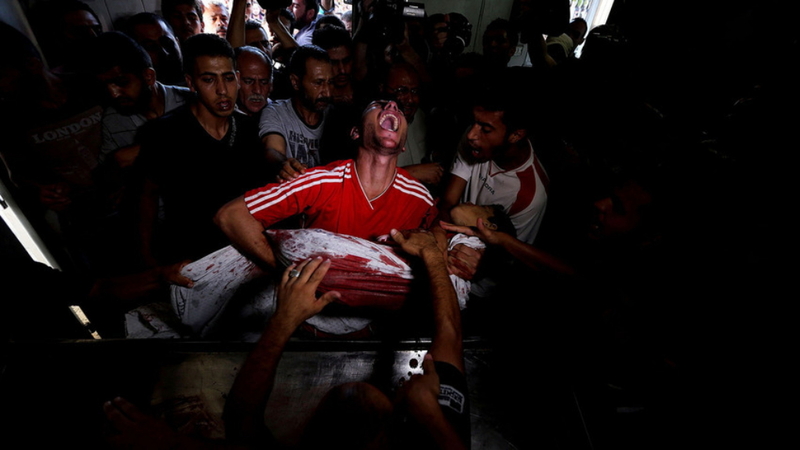 The corpse of Ismail Bakr was placed in the police post the night before the IDF missile strike. 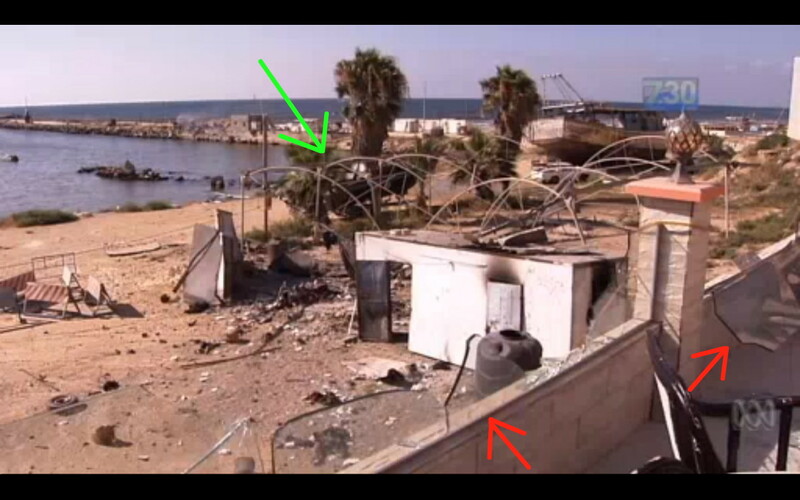 Mohammed, Ahed, and Zakaria Bakr were put in a rubbish bin behind the Avenue Restaurant and Coffee Shop (red arrow). 5. On or around July 16, 2014, a Hamas triple agent gave the IDF fraudulent intelligence that two Hamas terrorists would enter the steel shipping container at around 4:00 p.m. local time in order to carry out some kind of attack. 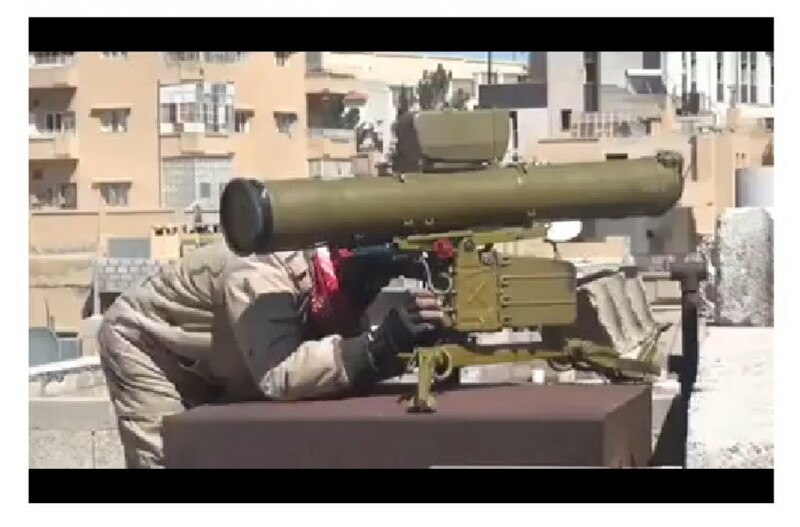 My best guess is that the Israelis were informed that someone would fire an antitank guided missile (ATGM) at a hotel full of western journalists. 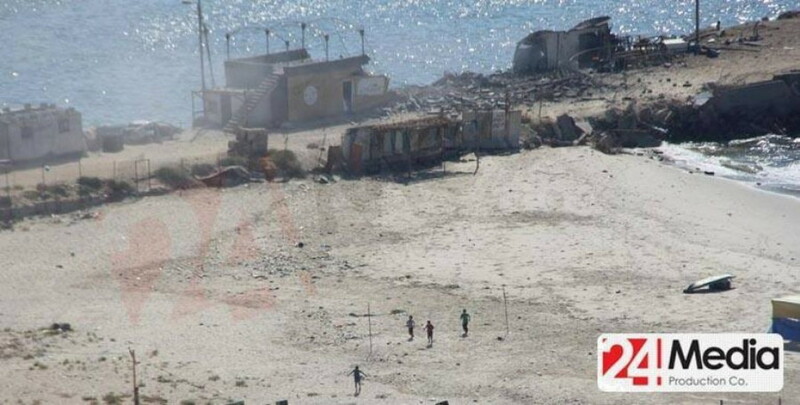 As part of the deception, Hamas had told the press that the metal structure was a fisherman’s hut used to store nets, and that children regularly played in it. In military parlance, this was Phase II of the operation, the commencement of hostilities. 6. 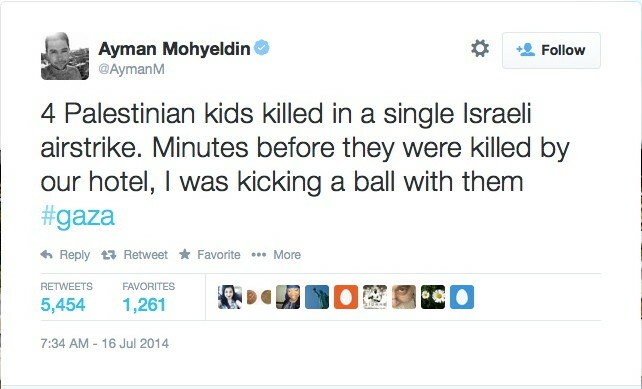 NBC News reporter Ayman Moyeldin claimed that he played soccer with four boys only moments before they were killed. No photos or videos of this game have yet been published. Also, the children were allegedly killed 328 yards (300 meters) from Mohyeldin’s hotel, the al-Deira. 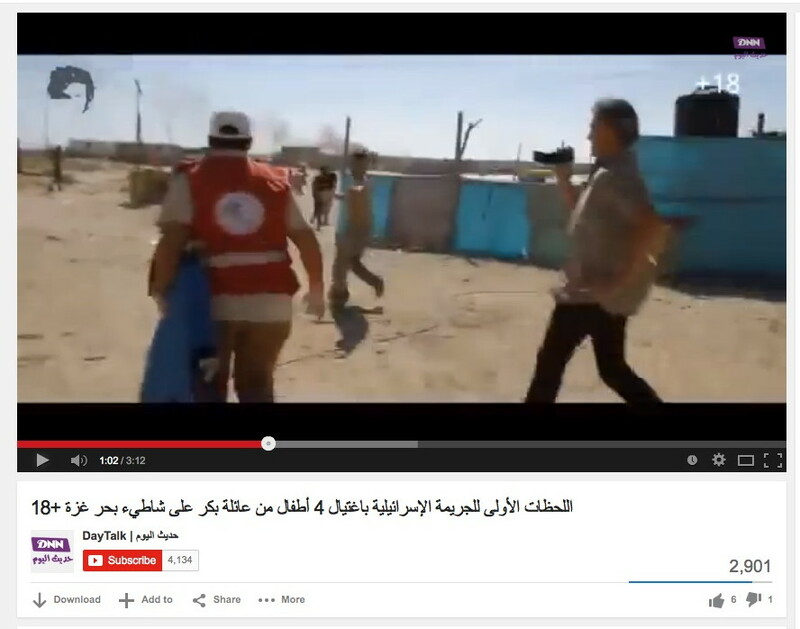 Like 24 Media Production Company, Mohyeldin said the boys were killed next to the al-Deira, but that’s not true. 7. 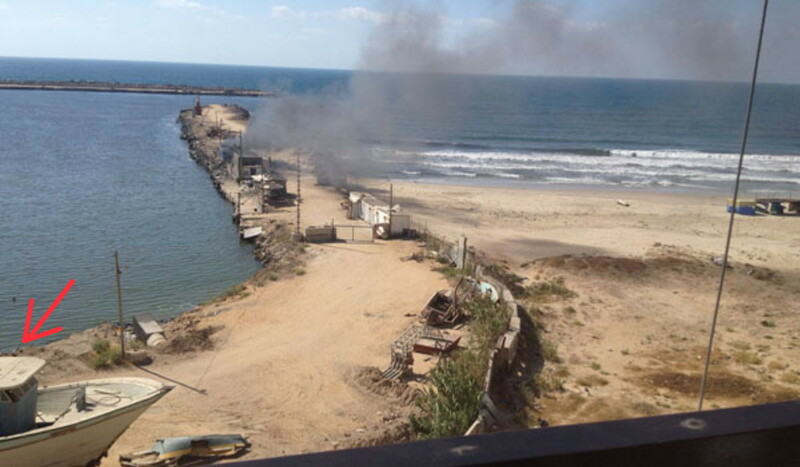 At around 4:00 p.m. local time, the IDF saw two men enter the Hamas police post on the breakwater of the Gaza harbor. The terrorists were unknowingly equipped with dummy weapons. This was to prevent a secondary explosion that would justify Israeli actions. 8. Hamas was watching the police post. At 4:10 p.m. an observer detonated a large explosive in a shed below the terrace of the Adam Hotel (green arrow). The IED was the first “tap” in what’s called a “double tap” (page 28). 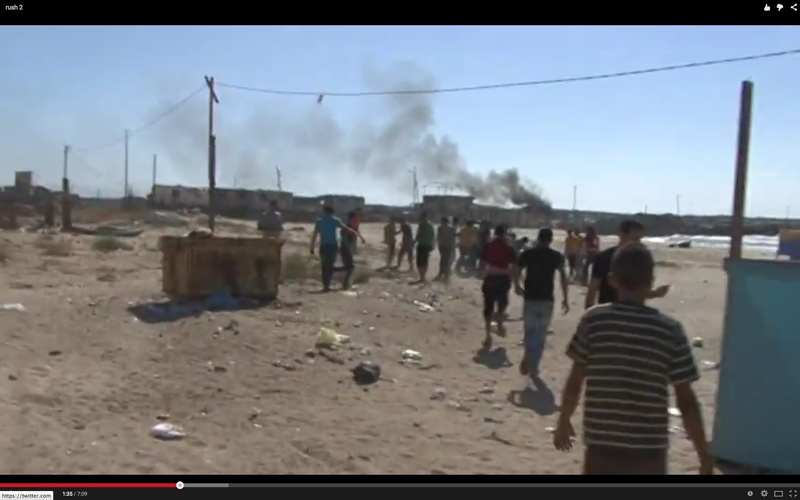 I believe that the IED was set off to convince the Israelis that a second attack was imminent. The intent was to make the Israelis think that journalists would crowd the terraces of the hotels after the first explosion, the terrorists would fire a missile at them, and then everyone would blame the IDF. 9. NBC News was filming the breakwater when the first IED went off. The police post is marked with a red arrow. This screen grab means that NBC had advance notice of the explosion. 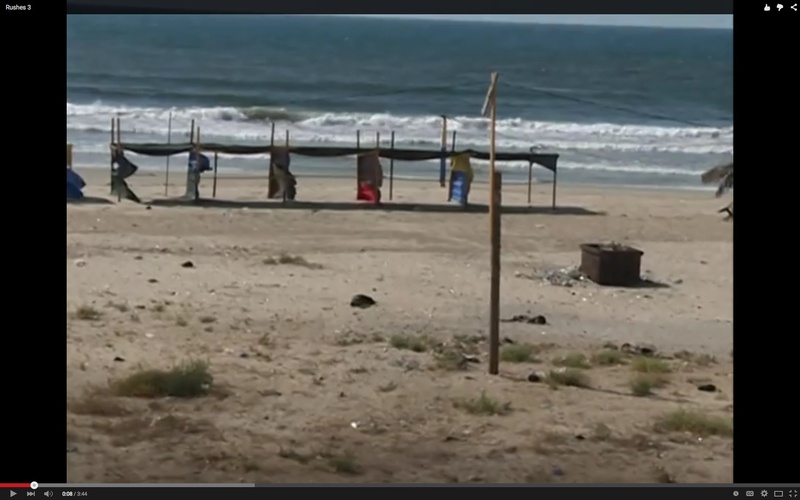 Why else would they be shooting an empty beach through the window of a room in the al-Deira Hotel? NBC has not released video of the missile strike itself or of the aftermath. 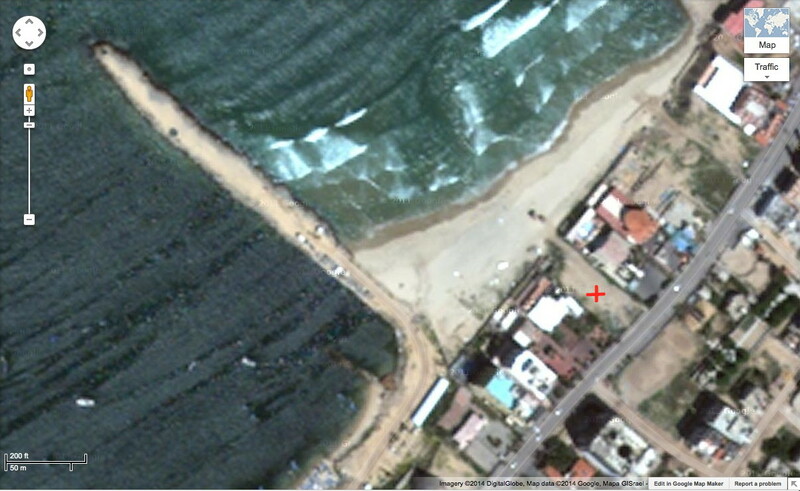 In total five video cameras were filming the Hamas naval compound or the beach before anything happened. Here’s what the IDF said after the incident. 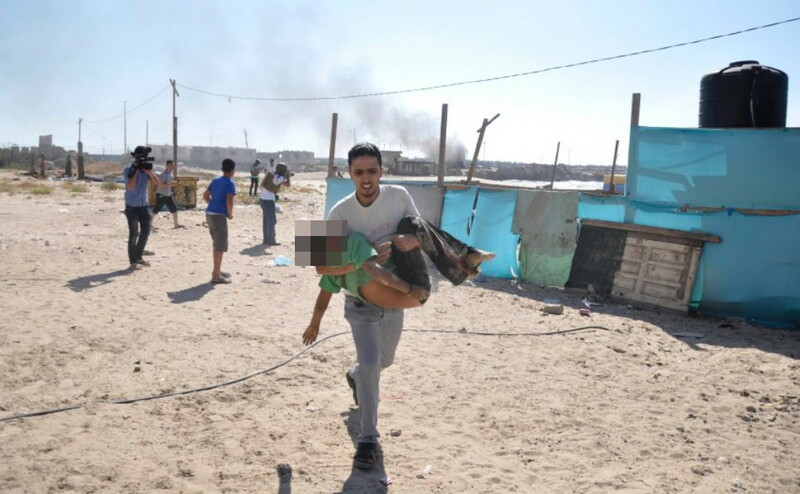 The IDF had a target—a Hamas terrorist target. We had intelligence pointing specifically to that location. They said they had intelligence, which is information. So did NBC News. They had intelligence pointing specifically to that location, which is why they put a camera in the al-Deira Hotel and filmed an empty beach and a breakwater with no kids running around on it. Exactly like the IDF, they were given information that something would happen at that place at a certain time. 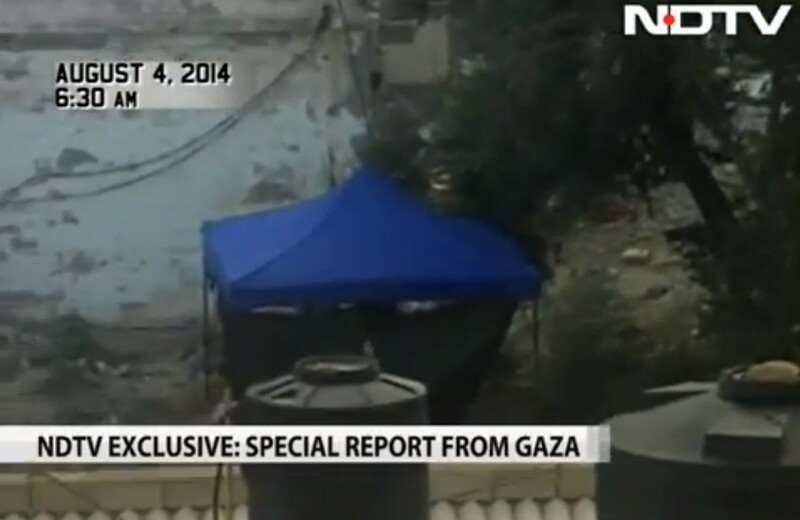 The NBC News video that captures the sound of the first explosion is proof that Hamas set up the IDF. 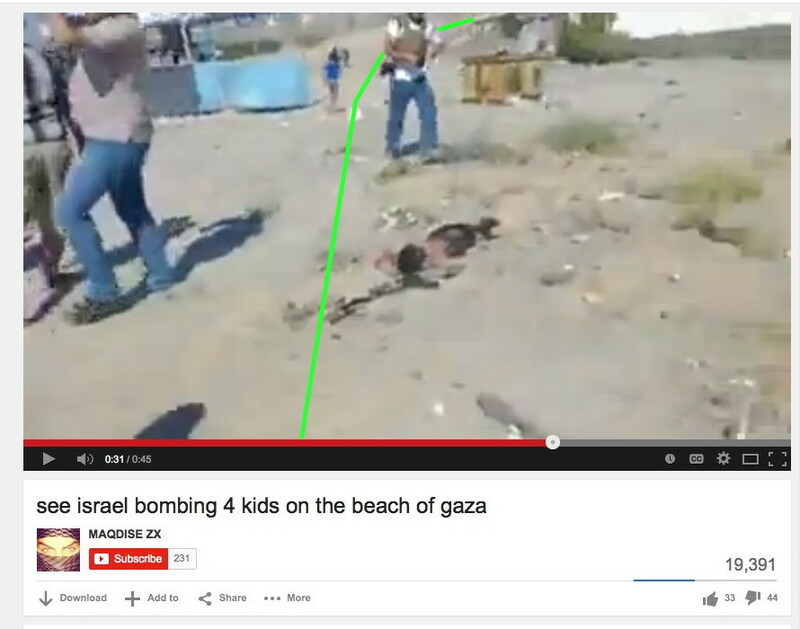 Someone told the IDF and NBC News the exact same thing, and we have the evidence on video. 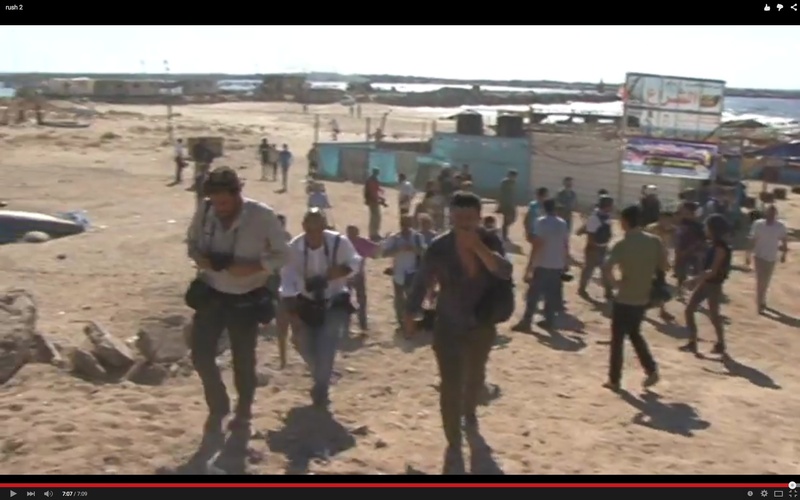 NBC News sent a camera crew, and the IDF sent a UAV (unmanned aerial vehicle). 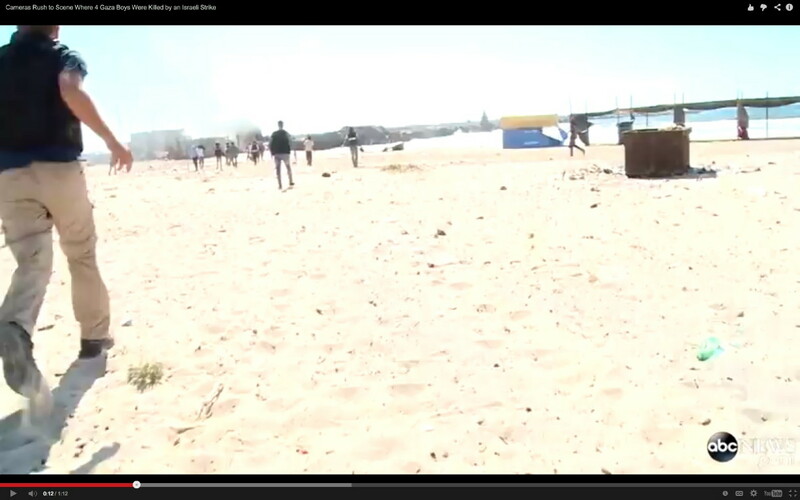 Again, why would NBC News film an empty beach, catching the sound of the first explosion on video? The obvious answer is that they were tipped off beforehand. 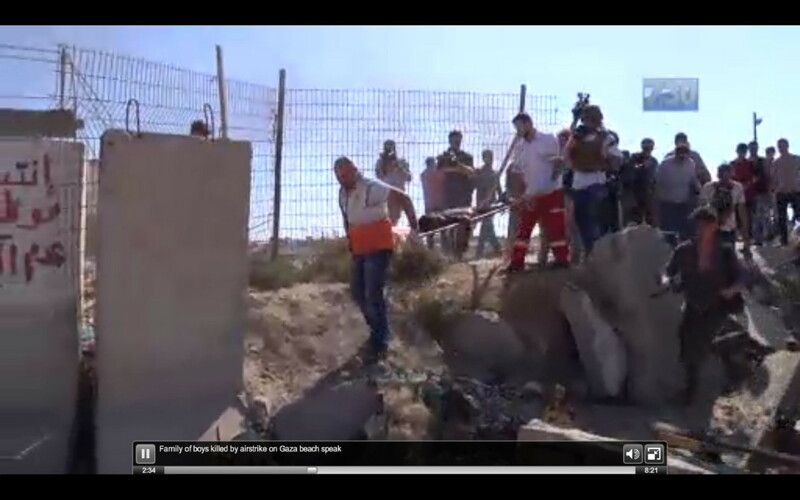 Neither the IDF nor NBC News had any reason to concentrate their attention on that mangled shipping container. Not unless they were both given intelligence by Hamas. 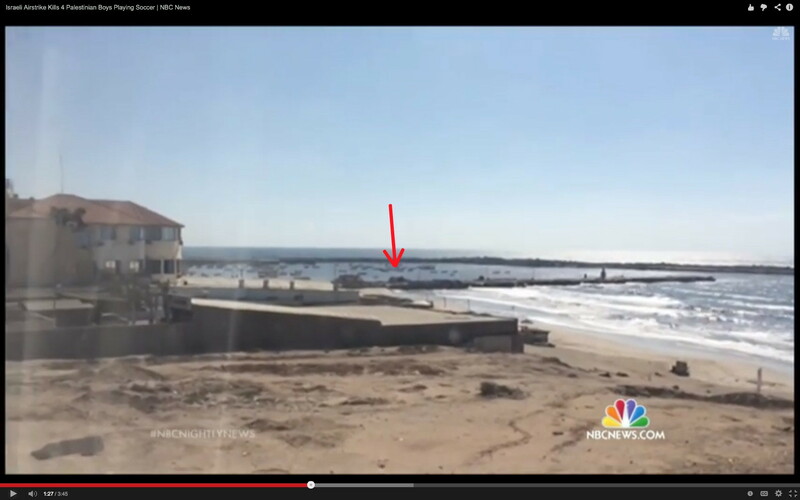 The only plausible explanation for the IDF and NBC News taking notice of that breakwater is that they were told to look at it. And the IDF says in plain English that they had the same intelligence that NBC News had. It’s inarguable proof of Hamas knowing ahead of time what would happen, and that means I’m right. This was a deception operation. 10. Seconds after the IED exploded, an Israeli UAV fired a small air-to-surface missile at the steel container on the breakwater. French TF1 News published footage of the immediate aftermath of the missile strike. The actual impact was edited out of the video. You can see the top of a boat behind the subtitles. 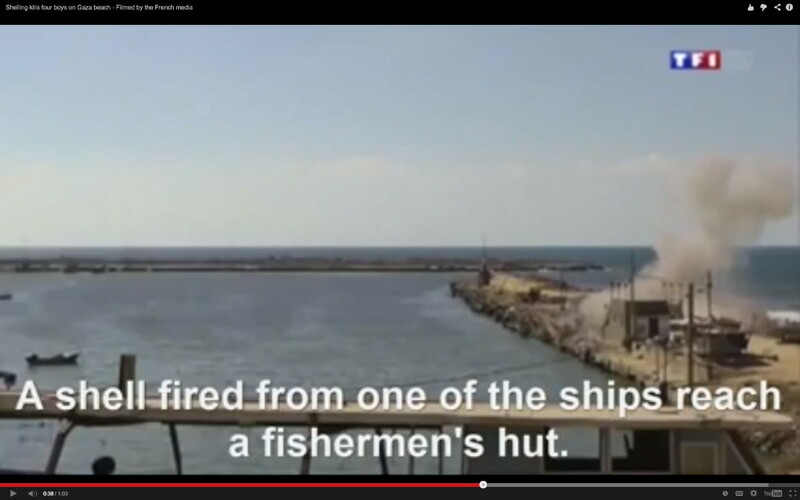 Although the news reporter says “shell,” the police post is clearly hit with a small missile rather than the 76mm shell of an Oto Melara autocannon, the only weapon the Israeli navy could have used in such a strike. 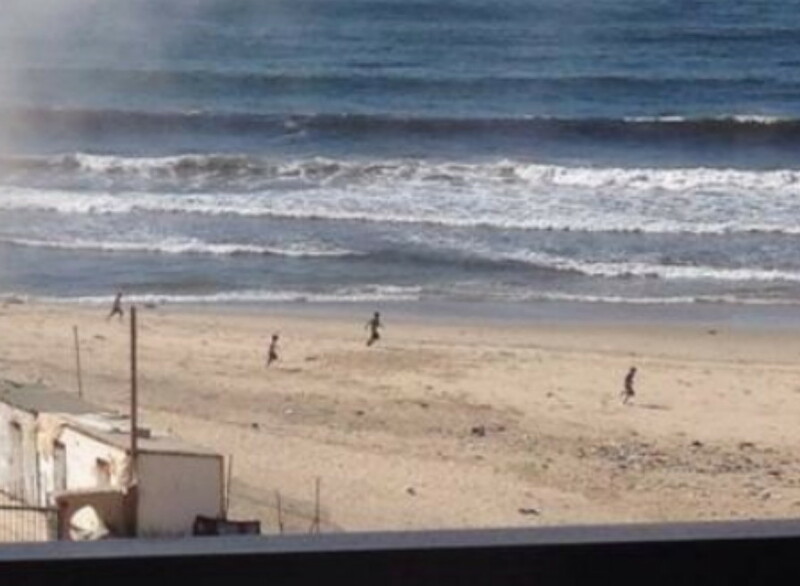 The Israeli navy immediately denied firing at the beach. 11. 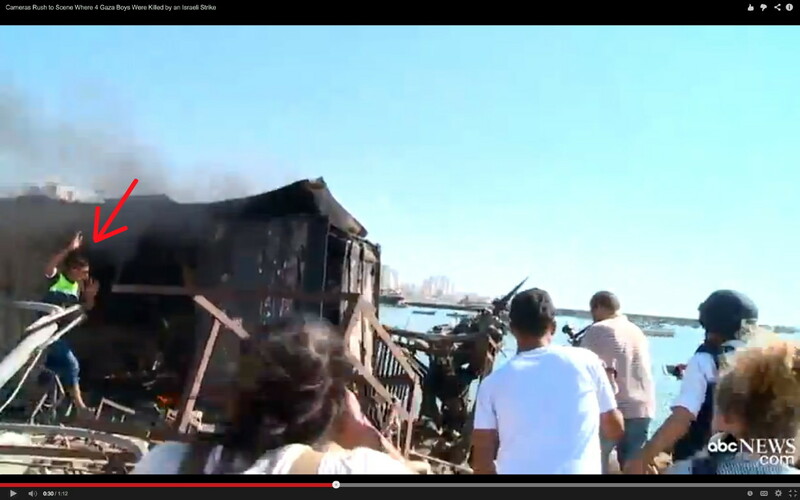 The boat in the TF1 News video was located in front of the Commodore Hotel. 12. Peter Beaumont of the Guardian was staying in the al-Deira Hotel, 328 yards (300 meters) down the beach. He heard the first explosion. Through the smoke from the missile strike, he saw three boys and one man run furiously along the breakwater, jump onto the sand, and begin to sprint toward him. 13. William Booth of the Washington Post was staying at the al-Deira. He heard the first explosion at little after 4:00 p.m. and smelled the gunpowder from 328 yards (300 meters) away. The shipping container on the breakwater was churning with smoke, and he saw “a gang of children” run from inside it. 14. Al-Jazeera reporter Stefanie Dekker—staying in the Commodore Hotel—heard two explosions and photographed four boys on the beach, running from the breakwater in the direction of the al-Deira Hotel, where most foreign journalists were staying. All four boys were dressed in dark clothing. 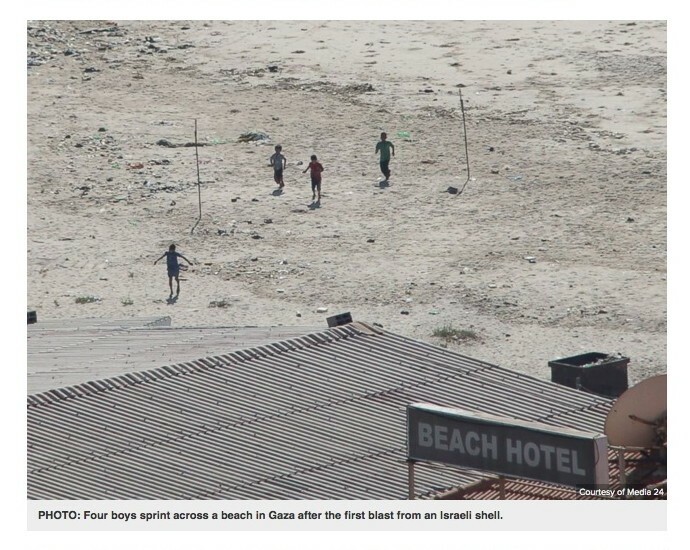 These were the decoys whose job was to distract the press and tell the the world how they were targeted by murderous Israelis while playing on the beach. They hid in spaces dug in the sand behind slabs of concrete at the base of the breakwater. 15. 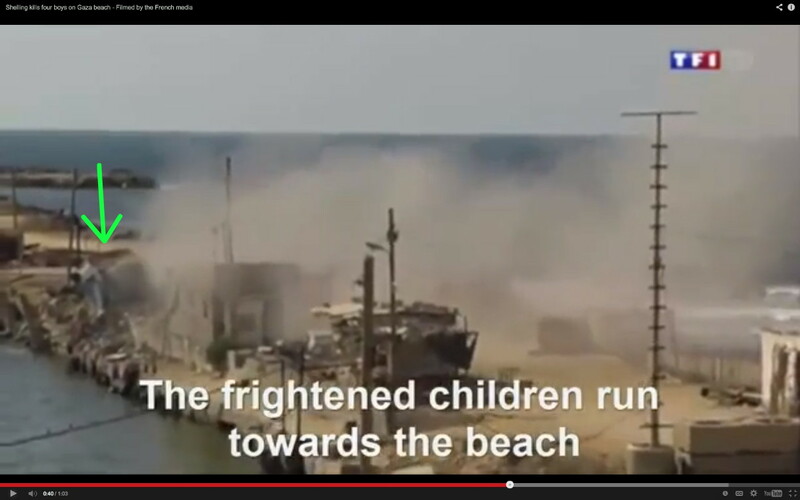 Gallagher Fenwick of France 24 said that he witnessed four boys run from the breakwater after the missile hit. 16. New York Times photographer Tyler Hicks heard the first explosion, looked out the window of his unnamed hotel, and saw a child run out of the smoke, down the breakwater toward the beach. 17. Peter Beaumont said that the three boys and one man who ran from the breakwater then circumvented the brightly colored tents on the beach. 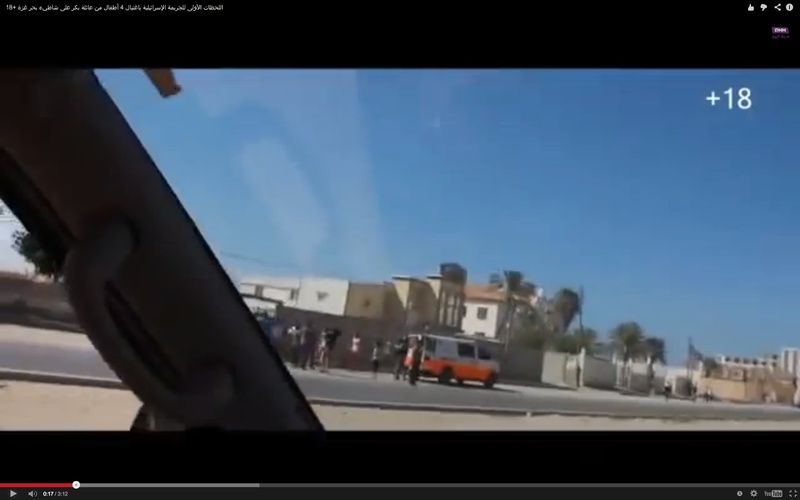 They waved and shouted at the reporters watching from the al-Deira. 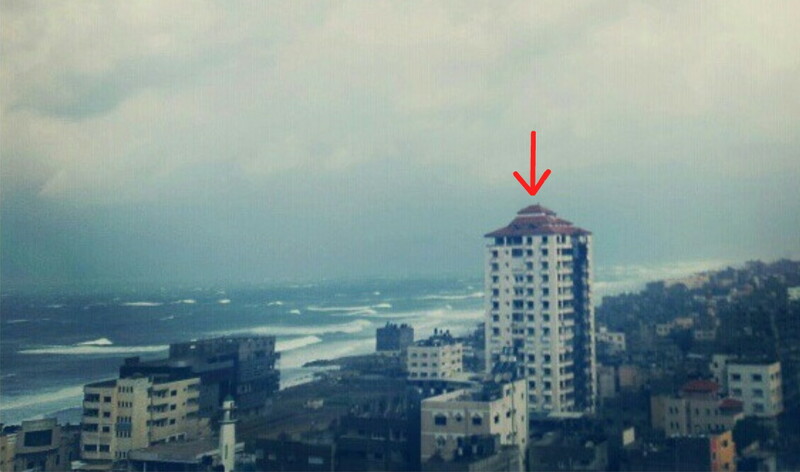 The red arrow in the image below shows a person near the Hamas compound, as seen from the terrace of the al-Deira Hotel. Not a single photographer or cameraman in the al-Deira Hotel photographed or filmed the four to six males running toward them. 18. Gallagher Fenwick said he personally witnessed a second explosion kill the four running boys on an open, empty beach. He clearly saw them die. 19. 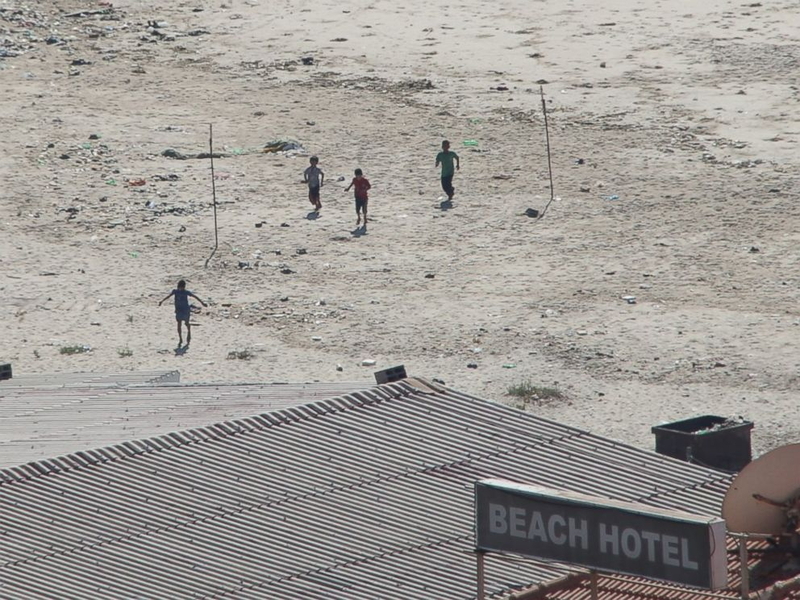 A waiter at the Beach Hotel said he saw the four boys playing soccer (football) on the beach, when they were hit by two projectiles and killed. 20. Tyler Hicks heard a second explosion thirty seconds after the first. When he immediately looked, he saw four boys lying dead and motionless in the sand. Hicks, however, was filmed running to the breakwater past the place where three dead boys would later be “found.” There were no bodies present at the time. 21. William booth saw a second explosion directly behind the running children. Six boys arrived at the hotel, along with a young man bleeding from the stomach. This man was put in a taxi by Mahmoud Abu Zbaidah, the bellman, room cleaner, and night watchman. 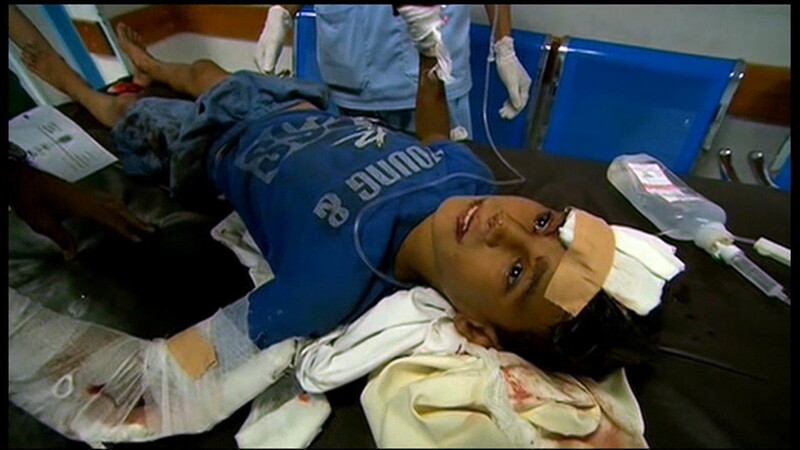 Two of the six boys were wounded. 22. Peter Beaumont wrote of a second explosion, but he carefully avoided saying that he witnessed it. 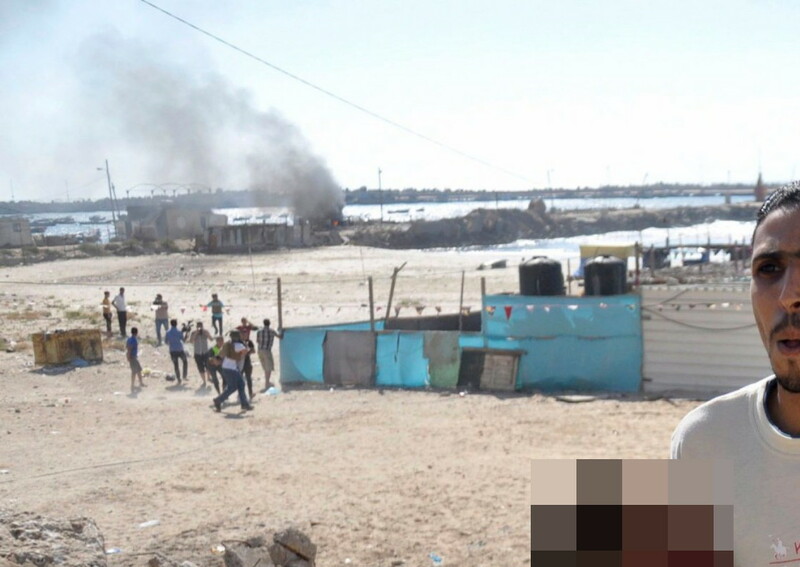 Though he saw three boys and a man running, he said only three males reached the al-Deira: Hamad Bakr, age thirteen, wounded in the chest; Motasem-Muntaser Bakr, age eleven, wounded in the head and legs; and Mohammad Abu al-Watfa, age twenty-one, wounded in the stomach. There is no unambiguous video of two explosions. All that were published are the aftermath or the sound. 23. Photos show four boys—not two or six—at the al-Deira Hotel. 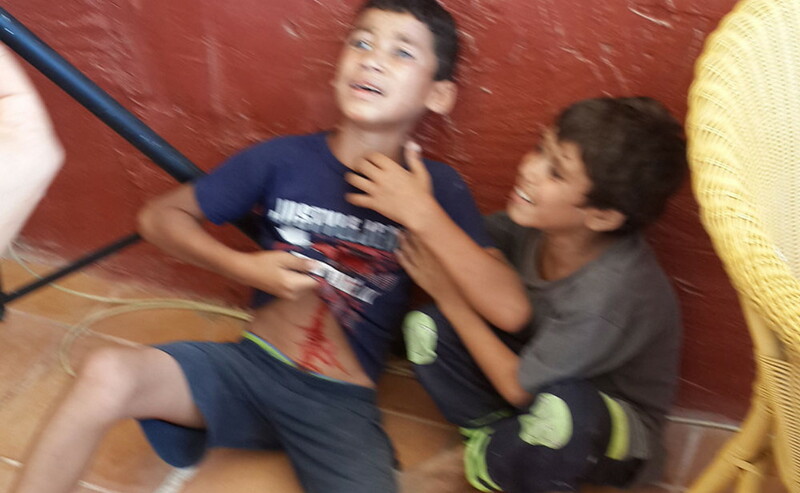 Hamad Bakr, thirteen, is on the left in the top photo, his seven-year-old brother Younis beside him. Motasem-Muntaser Bakr, eleven, is in the second image. The boy in the green shirt is Nasser Fadel Bakr. These are the decoys seen in Stefanie Dekker’s photo. All the alleged survivors of the Israeli attack told radically different stories that can’t be reconciled. 24. Peter Beaumont said that a skinny man in his thirties also arrived with the boys. He was wounded in the stomach. No photos or video of him have been published. 25. 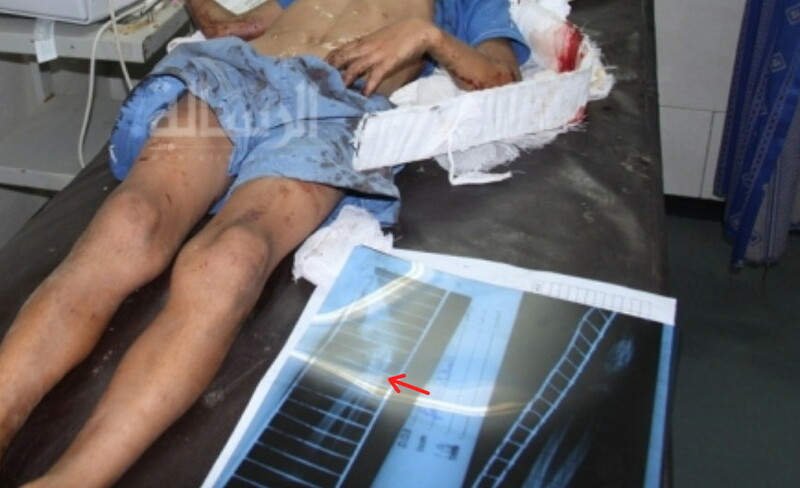 The faked photos created by 24 Media Production Company purport to show that one boy was killed in the Hamas police post on the breakwater, four boys ran for their lives, and three were killed by the second explosion. These images do not comport with a single eyewitness account. 26. After the second explosion—around 4:10 p.m.—Wall Street Journal correspondent Nick Casey ran from the Commodore Hotel and found two adult males dead in the police post with Ismail Bakr. He deleted this tweet without explanation. 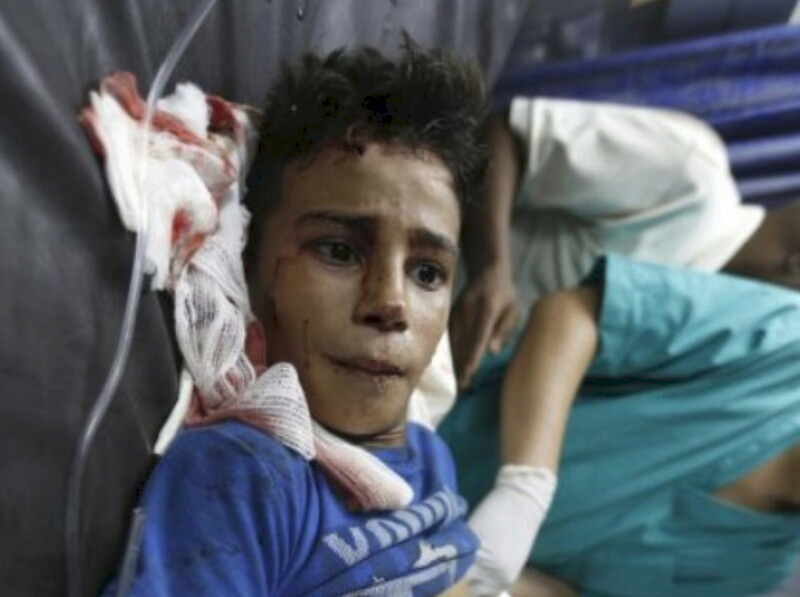 However, it confirms that the IDF fired at adults. 27. Liseron Boudoul of TF1 News was among the first western reporters to reach the breakwater. An anonymous Palestinian employee of the Commodore Hotel said that western reporters arrived at the breakwater about two minutes after the second explosion. 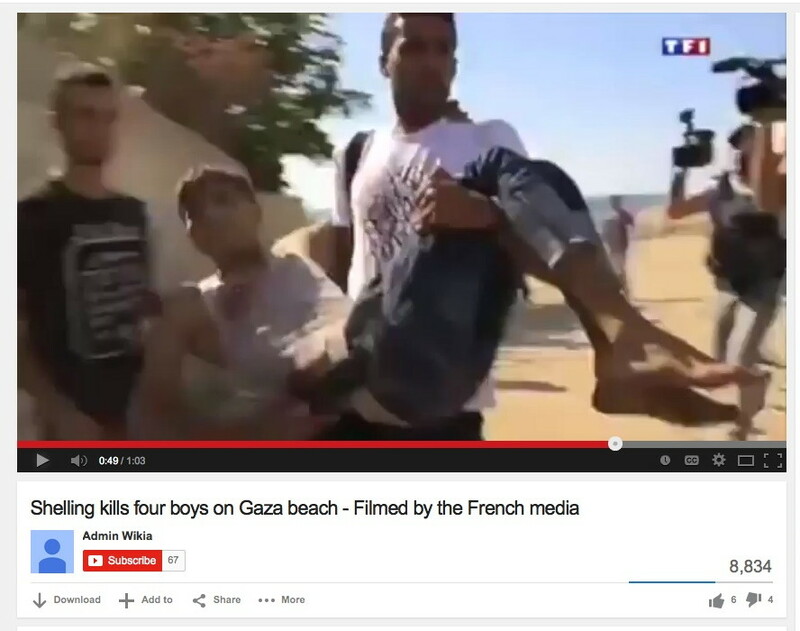 Boudoul ran past the locations in the sand where the bodies of the three other dead boys would later be “found.” The Zain Media Production video shows that there were no corpses present at around 4:15 p.m.
28. Following Boudoul was ABC News correspondent Alex Marquardt, who ran from the Commodore Hotel onto the beach. His cameraman filmed the place where the bodies of three dead boys were later found. Only a few minutes after the second explosion, there were no bodies in the sand. 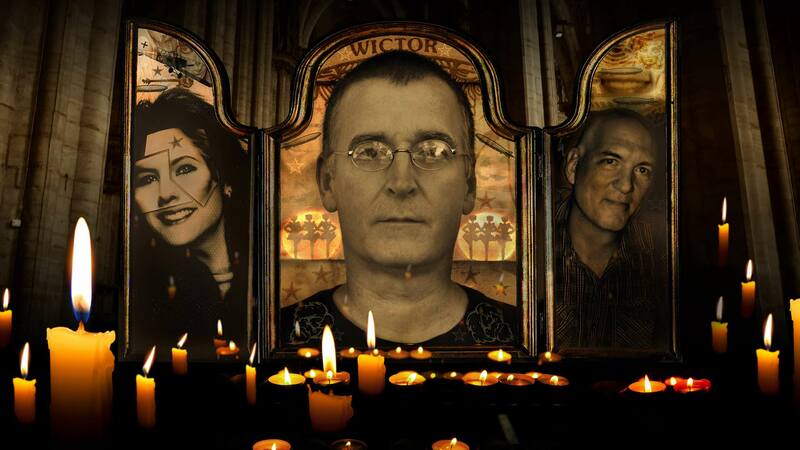 The ABC News report said that the three other bodies were discovered after the first corpse was removed. Three dead boys later appeared precisely where Marquardt and his cameraman had run. In the first photo below, the green arrows show the tents in the second photo, while the red arrows mark the scrub in the third photo. In the third photo, the green line indicates Marquardt’s route. If the bodies had been there at 4:15 p.m., Marquardt would’ve seen them. A journalist told me that the reporters would not have run to the scene unless they were told that it was safe and they had permission from Hamas. 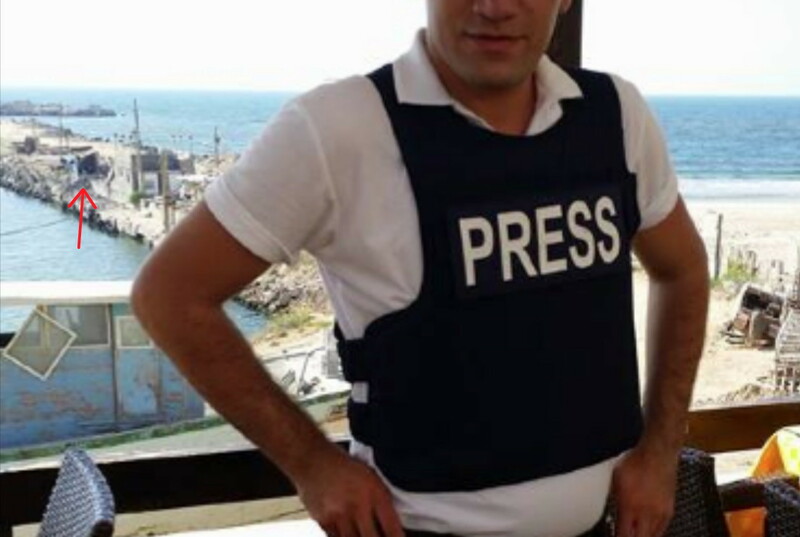 Reporters in war zones don’t rush toward explosions, and in Gaza, they don’t go anywhere unless Hamas allows it. 29. Alex Marquardt and the rest of the western media with cameras seemed to have been kept away from the police post. They were likely told that it might explode. 30. While Marquardt was waiting to get close to the police post, Mohammed Abu Watfa—pretending to be wounded—was put in a taxi at the al-Deira Hotel. He was the first person to be evacuated. The time was around 4:15 p.m. The man in the tan shirt is the Hamas second-in-command. He was the first operative to be caught on film. Jonathan Miller of Channel 4 News tried to question the hotel staffers carrying Watfa, but the uninjured man moaned loudly and theatrically, cutting off the conversation. Watfa was later identified as a coffee-shop employee. He claimed that he saw four dead boys in the sand, and he and three others were wounded. After his coffee shop was shelled, the ambulance took him to the hospital. Watfa’s version of events is a complete fabrication, wrong in every detail. 31. 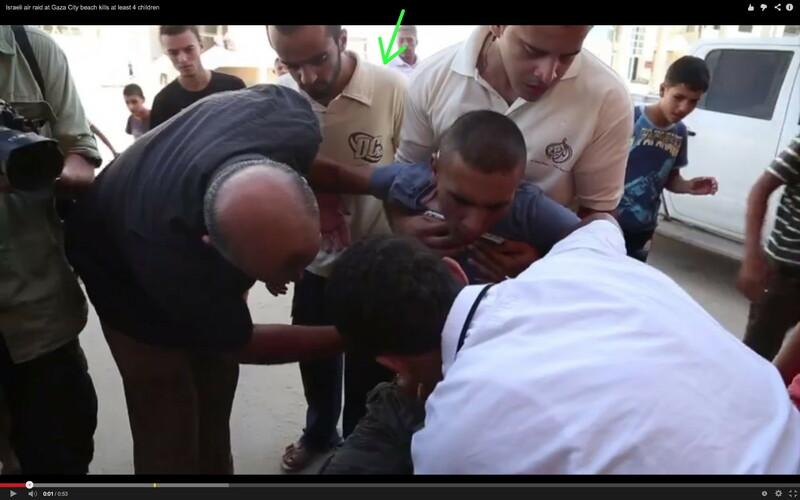 The Hamas commander of Operation Four Little Martyrs was photographed supervising the removal of Mohammed Abu Watfa. 32. Jonathan Miller then ran to the seaside terrace of al-Deira Hotel and reported that journalists were giving first aid to two wounded boys and one boy in shock. 33. 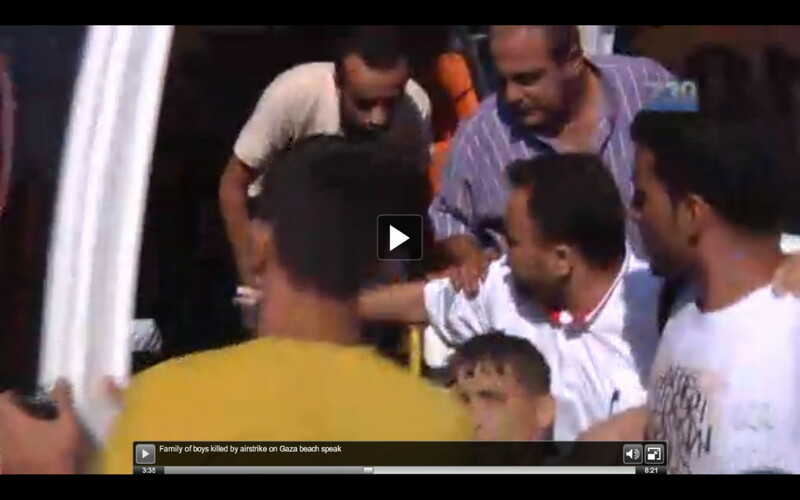 Peter Beaumont of the Guardian is one of the journalists who attended to the injured boys. Beaumont said Motasem-Muntaser Bakr was wounded in the head and legs. In fact his head wounds did not bleed, and he had no injuries to his legs. Motasem-Muntaser had a broken arm, but he clearly acquired this injury before the operation began. It was a closed fracture of the ulna; an X-ray showed that the bone was snapped perfectly in half. The break was caused by a deliberate blow with a slender object such as a steel rod. Separation of serum from clots on Motasem-Muntaser’s trousers indicates that the blood was on his clothes for one to two hours. 34. Western and Palestinian media climbed up on the breakwater. 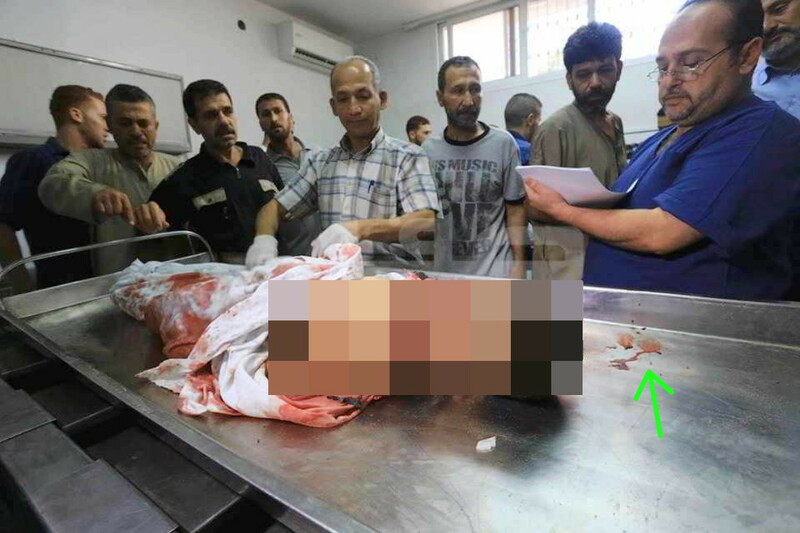 The body of Ismail Bakr was “discovered” by a Hamas operative with a Day-Glo green panel on his shirt. This young man wore the rolled trouser legs of a Wahhabist Salafist, and he was present at every crucial stage of Operation Four Little Martyrs. 35. 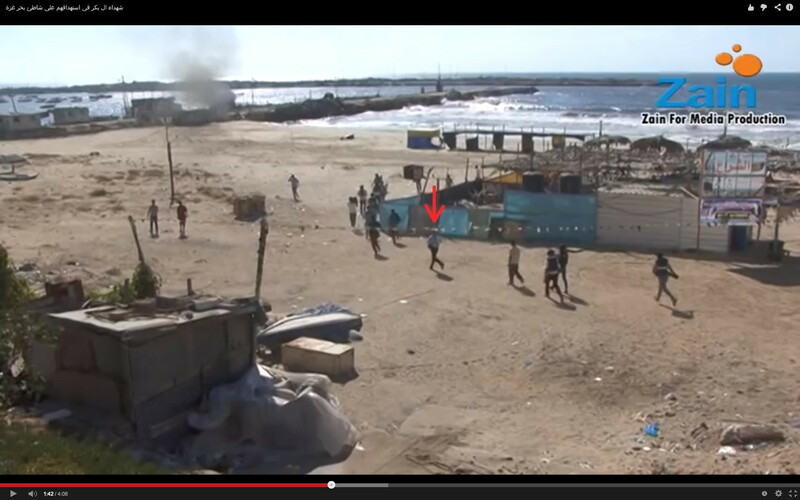 The Hamas commander in the purple shirt walked to the breakwater and guided the first ambulance to a stop. One reason the ambulance parked far away from the police post is that the dead child could be filmed and photographed for several minutes as the paramedics carried him back. The second reason the ambulance the ambulance was parked so far away was to lure the journalists off the beach. There was a major failure in the Hamas plan that had to be rectified in secret. 36. The paramedics ran to the police post. To their right, Liseron Boudoul conversed with two men, ignoring the drama around her. The white truck that drove to the post was used to remove the bodies of the adult terrorists who were the sacrificial lambs, the targets of the IDF. 37. The Hamas commander jogged to the police post. 38. 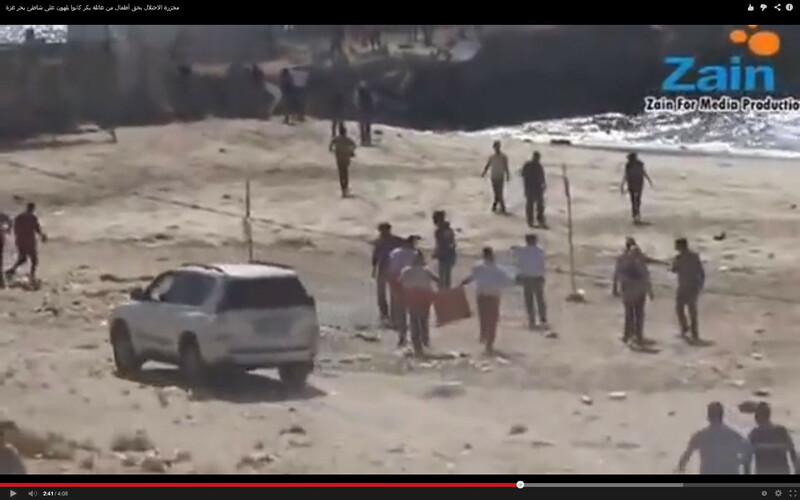 Western journalists on the breakwater filmed the removal of Ismail Bakr’s mutilated, burned body. Note that the formerly open end of the structure has been covered to give the impression of a hut. There is no daylight visible through the hole in the wall facing the camera. 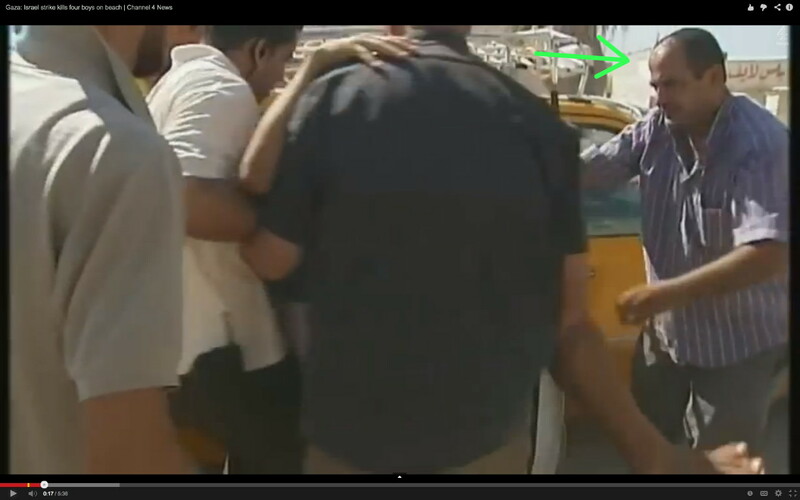 A Palestinian TV journalist (green arrow) helped in the recovery of Ismail Bakr. In reality this “journalist” is a Hamas terrorist. 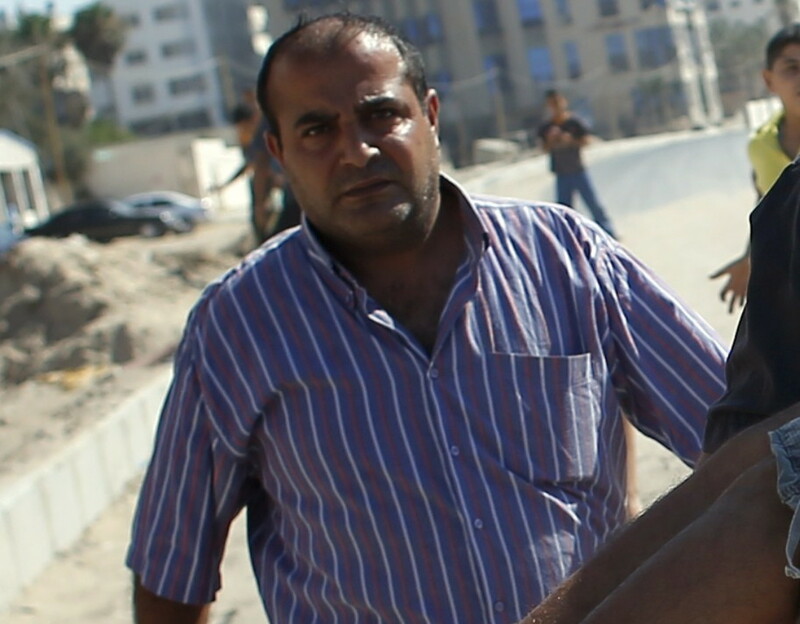 His name is Hamood Abu Kwaik, and he’s the driver and fixer for Tyler Hicks of the New York Times. 39. Kwaik took over the removal of the body. 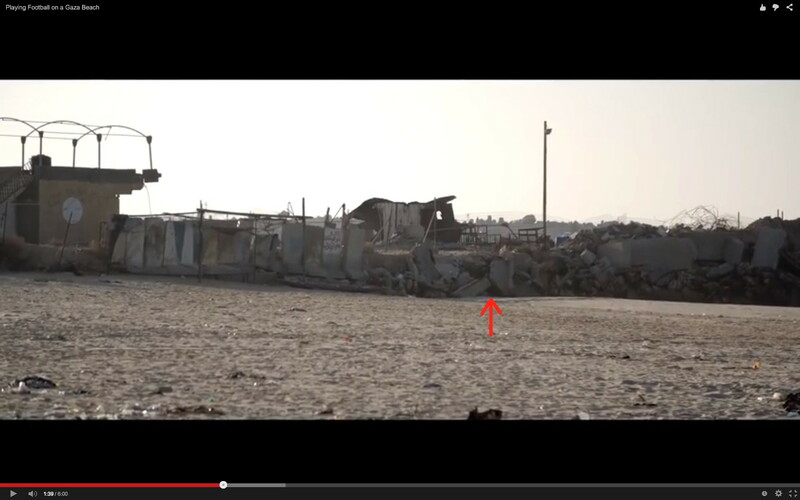 The Palestinian video proves that the children Stefanie Dekker photographed could not have clambered over the junk on the breakwater and made it so far down the beach in the few seconds claimed. 40. The great distance from the steel police post to the ambulance allowed time for photographs and video. 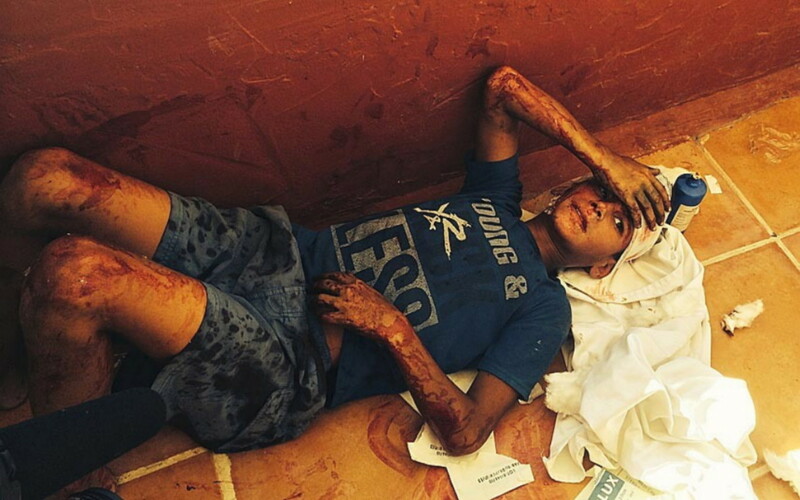 None of the gaping holes in Ismail Bakr’s body bled. His wounds were inflicted postmortem. 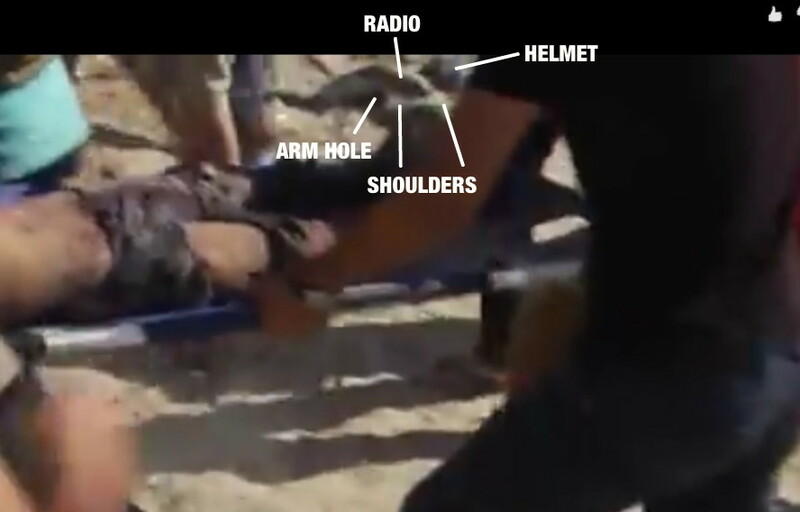 The raw video I purchased from Palestinian cameramen shows that his body was folded in half, his legs tucked behind him and touching the back of his head. His pelvis appears to have been removed. 41. 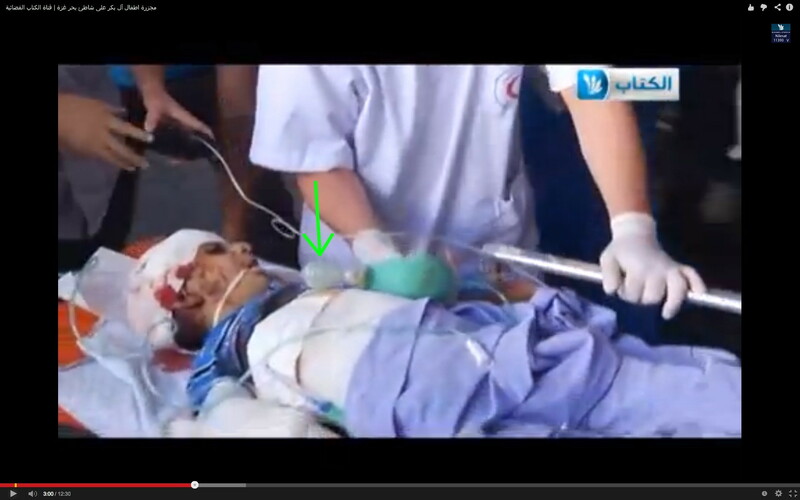 Hamood Abu Kwaik kept a close eye on the paramedics. 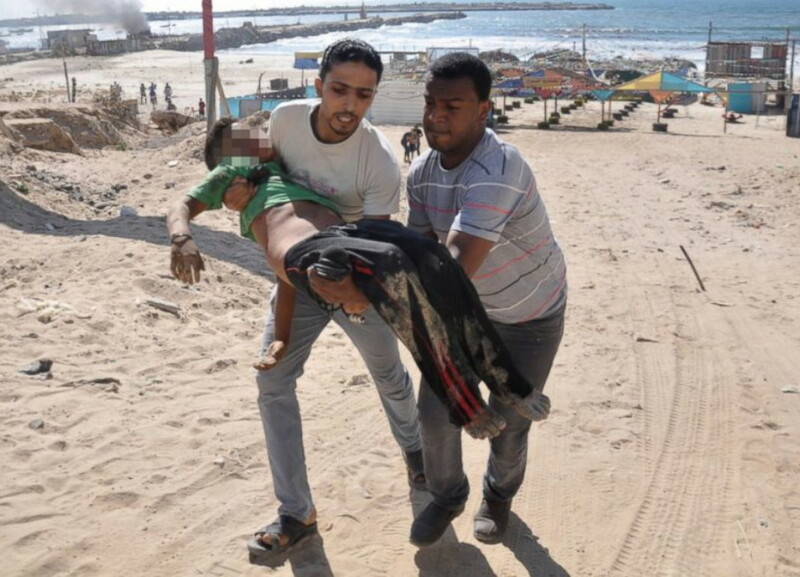 The Hamas second-in-command arranged the dead boy on the stretcher. We saw him earlier (purple arrow), walking in front of Alex Marquardt. Each X shows the future location of a dead boy, the color corresponding to the shirt that the child wore. 42. The paramedics were surrounded. 43. 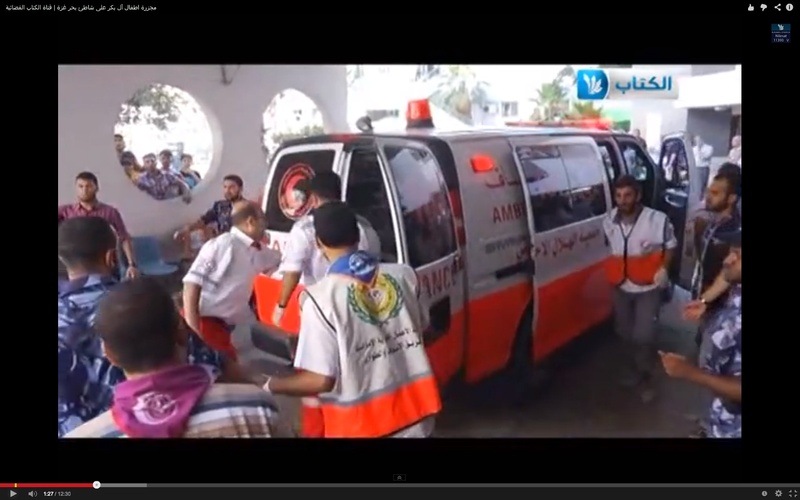 As the paramedics carried the body of Ismail Bakr to the ambulance, Liseron Boudoul (red arrow) stopped and spoke to the Hamas commander in the purple shirt (green arrow). 44. The throng of reporters, emergency personnel, terrorists, and an imam walked past the place where the three bodies would later be found. 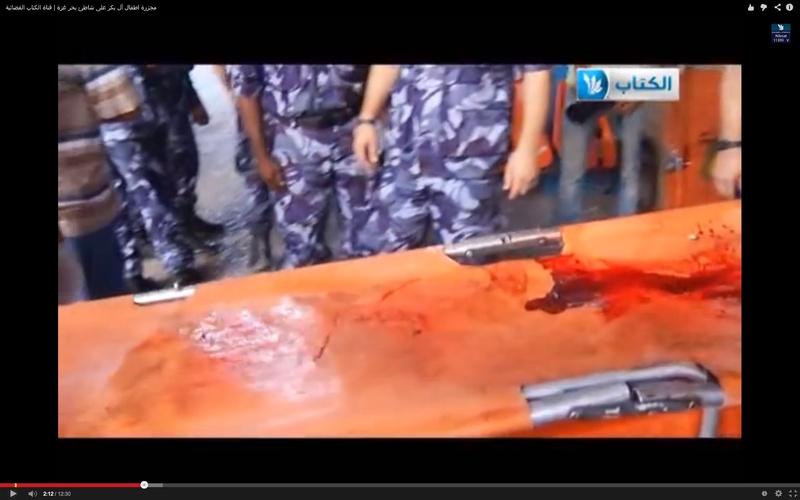 This footage shows yet again that during the recovery of Ismail Bakr, the other three corpses had not yet appeared. 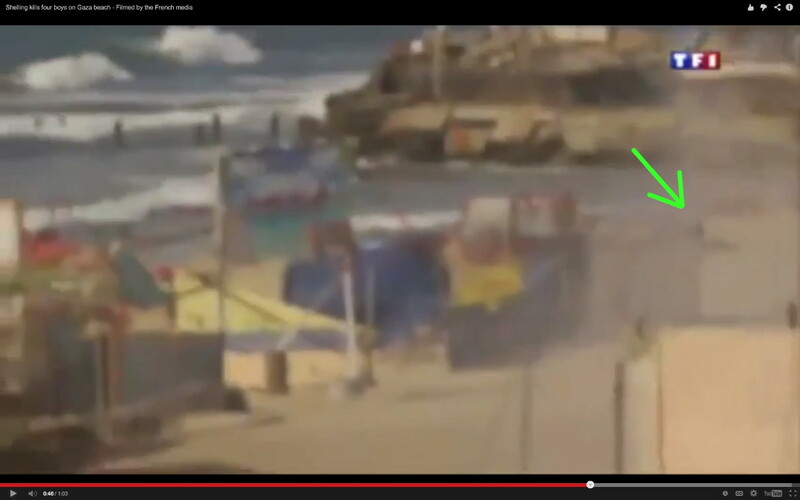 The Hamas commander (green arrow) followed. 45. Stefanie Dekker of al-Jazeera photographed Ismail Bakr being carried past the place where three more bodies would later be placed. Her photo shows that there were no dead children in the sand. In her report, Dekker said that the three other bodies were found after the first was removed from the beach. 46. 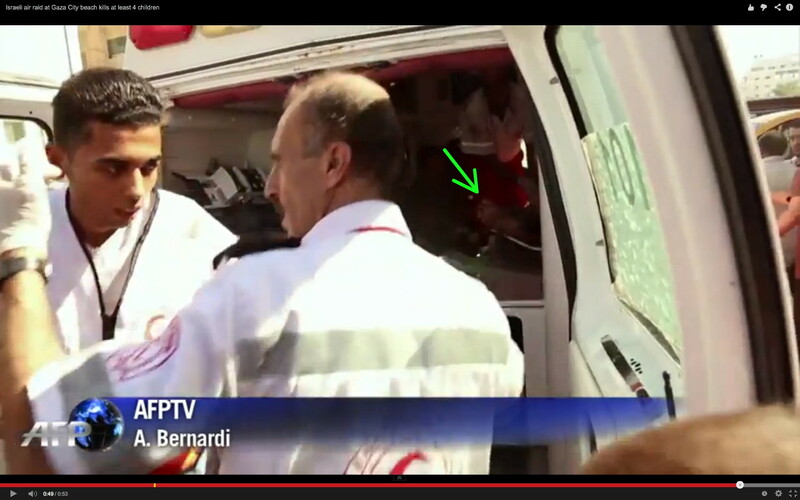 The paramedics loaded Ismail Bakr into the ambulance. 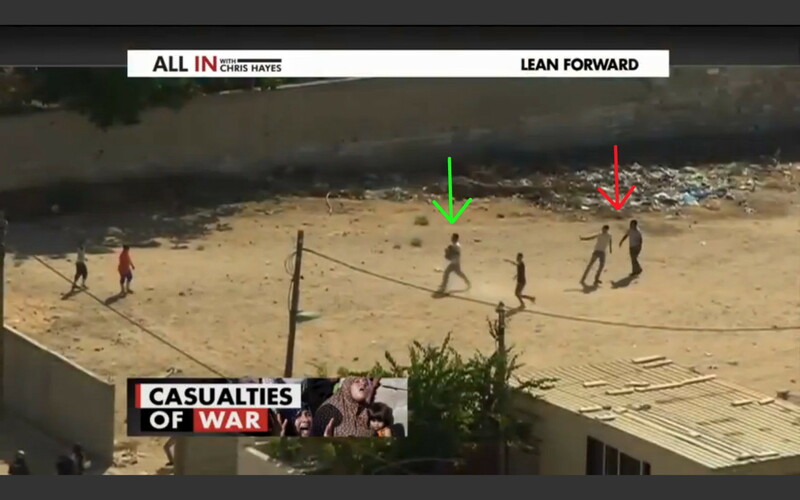 The crowd is mostly comprised of muscular thugs, a fake reporter (red arrow), and a lookout (green arrow). 47. The western press then completely cleared the area. The foreign journalists were obviously told to leave. They complied, as they always do when Hamas gives them orders. 48. 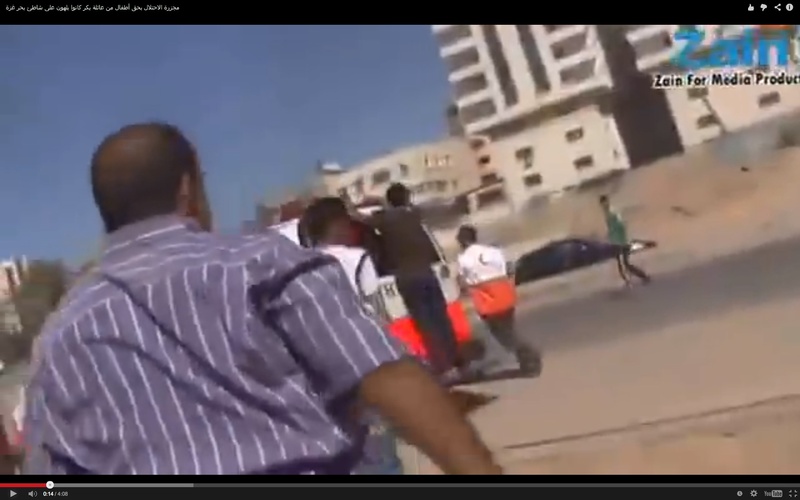 TF1 News published Palestinian footage of an explosion. The FT1 News report is so dishonest that it’s almost worthless. This was a Hamas IED detonating in the rubbish bin behind the Avenue Restaurant and Coffee Shop. The bodies of Mohammed, Ahed, and Zakaria Bakr were hidden in the rubbish bin, along with an IED. The bomb was intended to simulate an Israeli missile strike. It would mutilate the three dead boys and toss their bodies onto the sand, where reporters would find them. However, the IED failed to go off. Hamas sent two men to try and make the bomb safe, but it exploded. 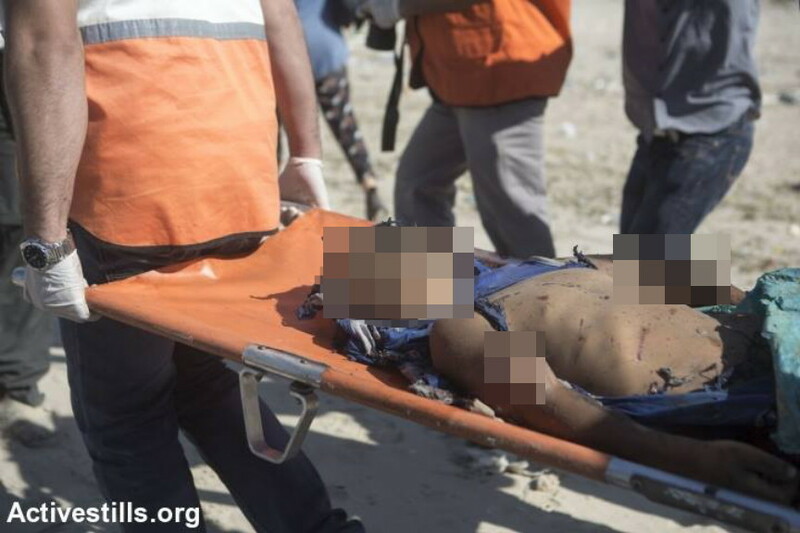 One Hamas operative was killed, and the other was seriously injured. He crawled into a blue tent on the beach. 49. 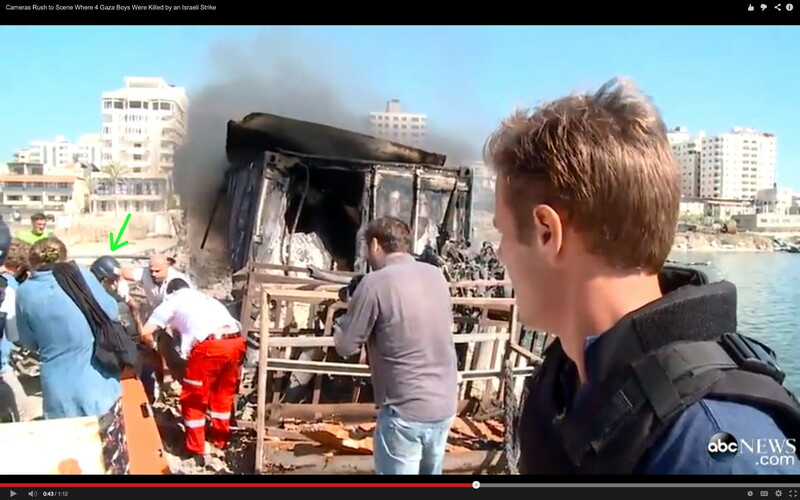 Stefanie Dekker of al-Jazeera News reported a third explosion sometime after the first two. She was not more specific than that. 50. 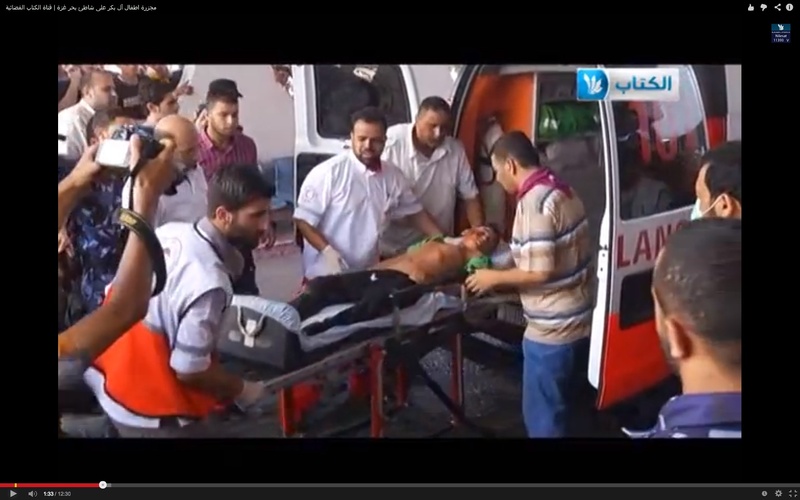 Palestinian “human-rights” organization al-Haq reported a third explosion after the first two. I don’t believe the two-minute time frame, because this is the only account making this claim. Also, I’ve learned to never trust Palestinian “human rights” organizations. 51. An ambulance arrived and parked in front of the Beach Hotel and Orient House. 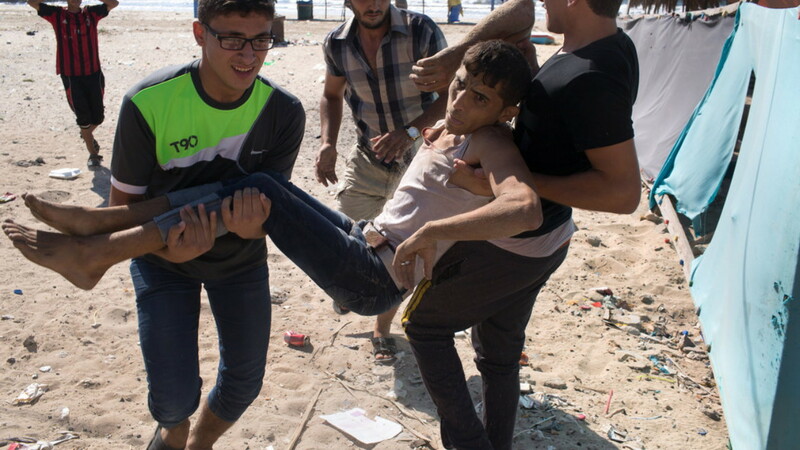 The paramedics went down to the beach, turned around, and came back empty handed, directed by Hamas terrorists and followed by a small number of Palestinian and Arab reporters. 52. The ambulance drove down the street. It parked in front of the Avenue Restaurant and Coffee Shop (red arrow) and waited. 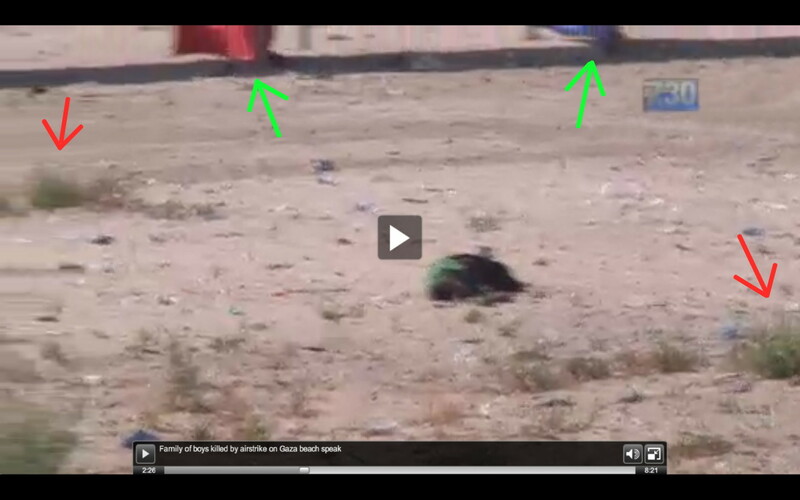 The green arrow indicates the dumpster seen in photos of Zakaria Bakr. 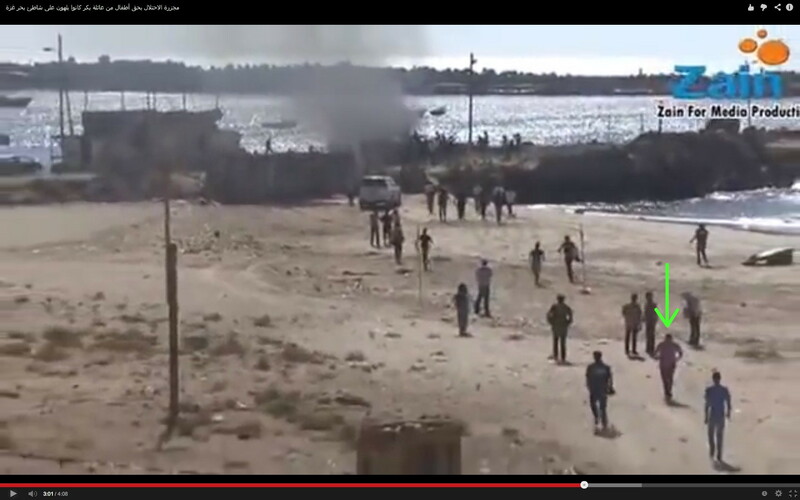 When this footage was taken, several men stood on the beach, waiting. 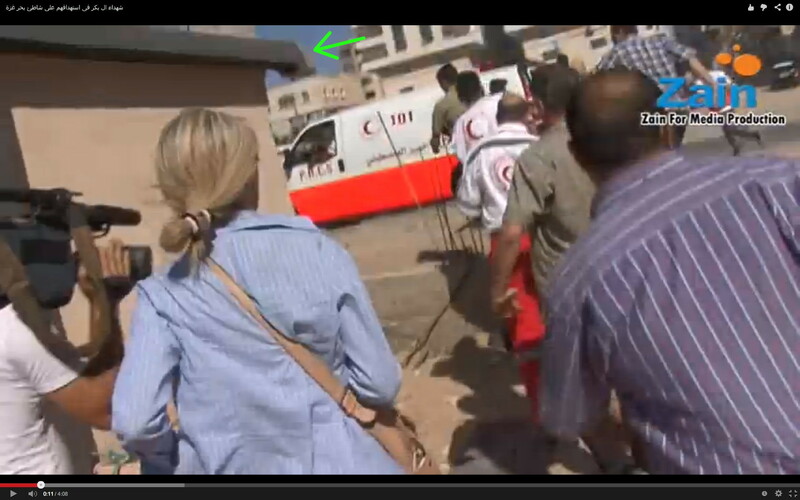 Later the ambulance would move forward to the violet X.
NBC News filmed the scene from the roof of the al-Ghifari Tower. 53. A second ambulance waited across the street from the Avenue Restaurant and Coffee House. 54. 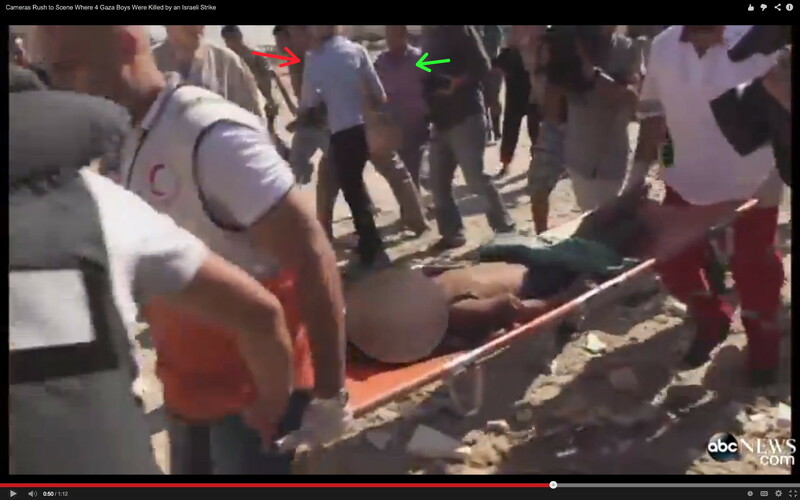 New York Times photographer Tyler Hicks (red arrow) was present when the body of Mohammed Bakr is removed. 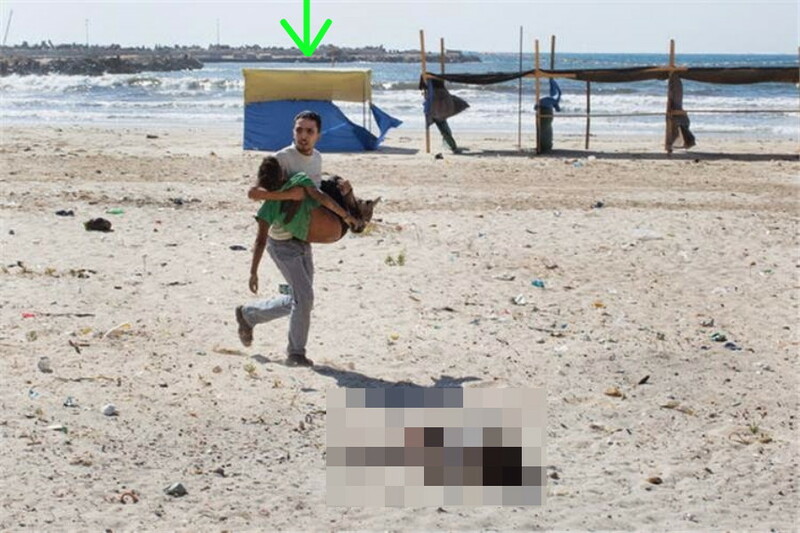 Hicks did not photograph the ground at his feet because the exploded Hamas bomber was lying in the sand, close to the body of Ahed Bakr. He wore body armor, which protected his torso. However, his head arms, and legs were blown off. NBC News didn’t publish the raw footage of what it captured. 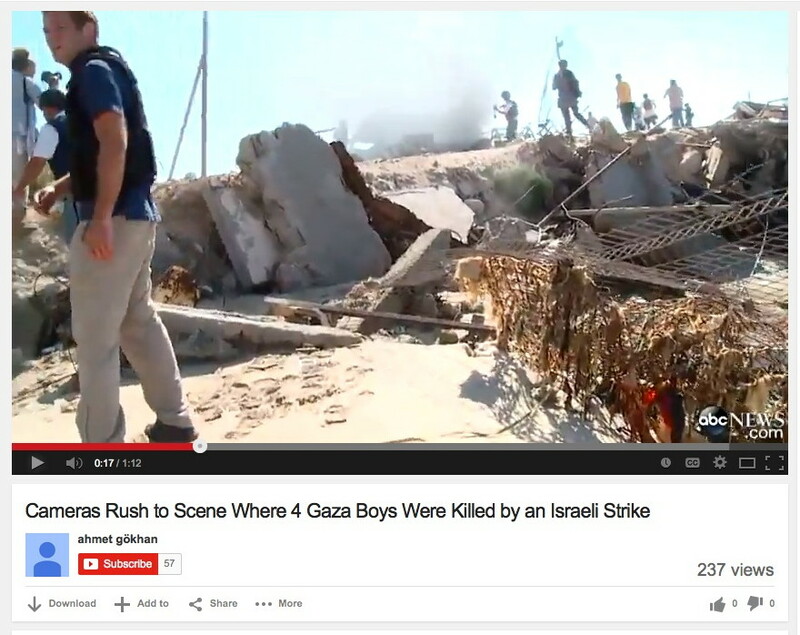 Instead, NBC went along with the lie that the IDF killed the four boys. Tyler Hicks follows suit. 55. The ambulance parked in front of the Avenue Restaurant and Coffee Shop prepared to roar down the street to the green X in the satellite image below. 56. As the paramedics ran to the ambulance, they were accompanied by Liseron Boudoul and the Hamas commander in the purple shirt. The ambulance raced down the street to the collection point. The Hamas commander supervised, and a lookout in a green shirt watched. 57. 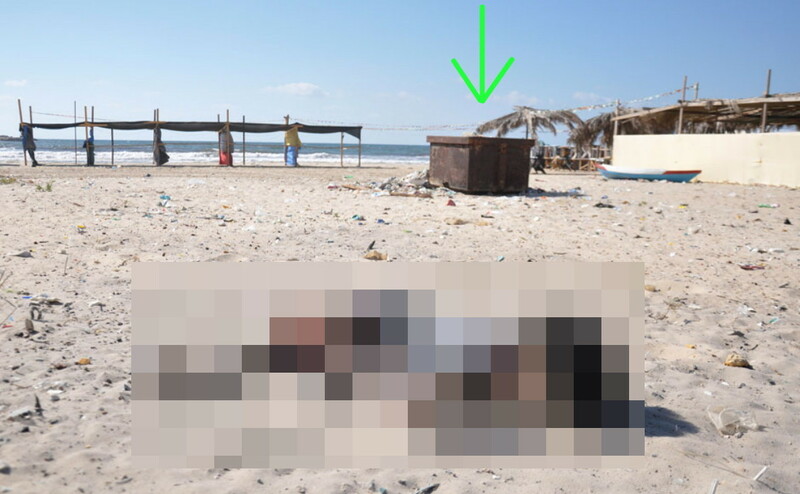 The bodies of Mohammed, Ahed, and Zakaria Bakr were either thrown out of the rubbish bin by the IED, or they were removed from the bin by hand. 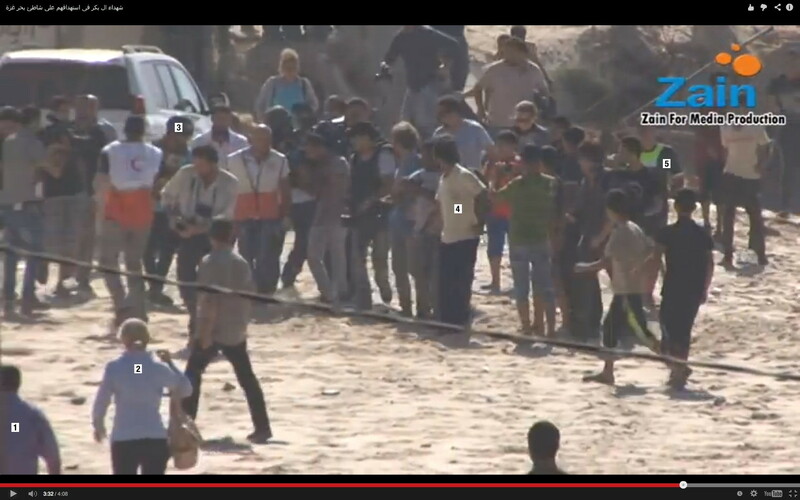 No footage has surfaced of the boys being placed in the sand. 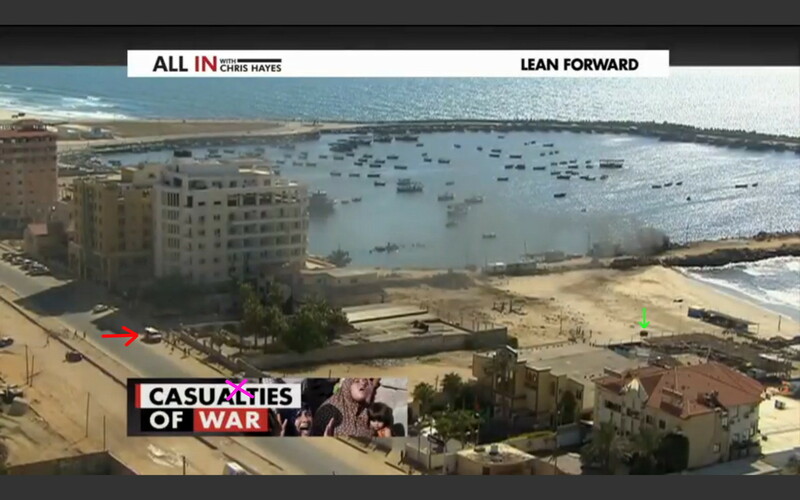 Note the yellow-and-blue tent below, seen in images broadcast both by ABC News and al-Jazeera. 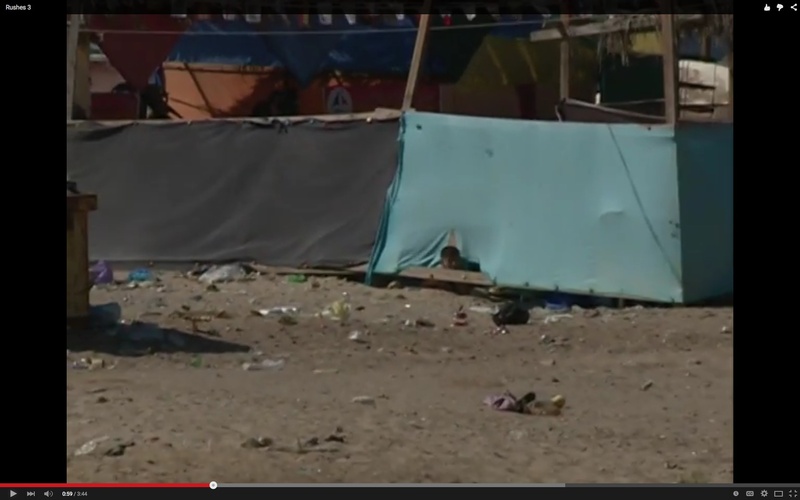 When the western press walked past this tent earlier, there were no bodies in the sand. 58. The shadows indicate that it was about 5:00 p.m., an hour after the first explosion. Also, none of the “rescuers” had blood on them. 59. 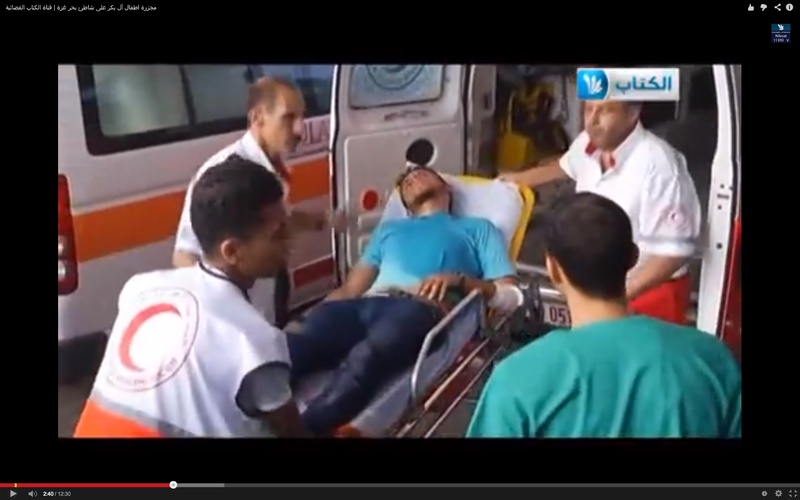 One ambulance waited for Mohammed Bakr. The other ambulance went down the street to the al-Deira Hotel to pick up Hamad and Motasem-Muntaser Bakr. 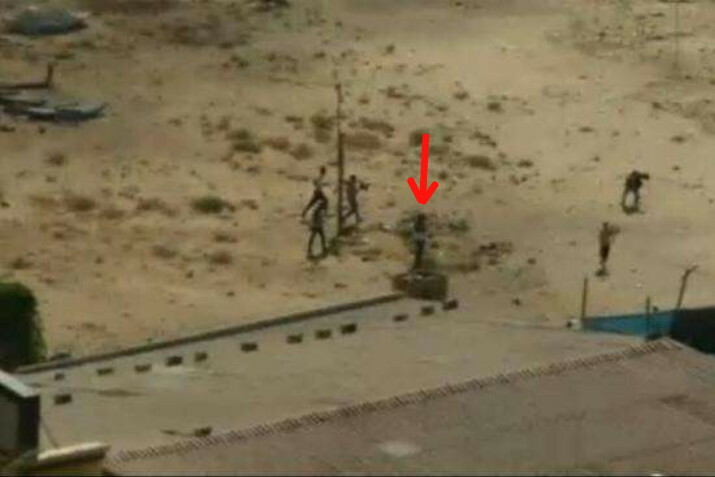 Motasem-Muntaser was on the right (green arrow) and Hamad on the left. 60. The assistant to the dead Hamas bomb expert was pulled from the blue tent. The back of his shirt was covered in blood, and he appeared to be paralyzed from the waist down. 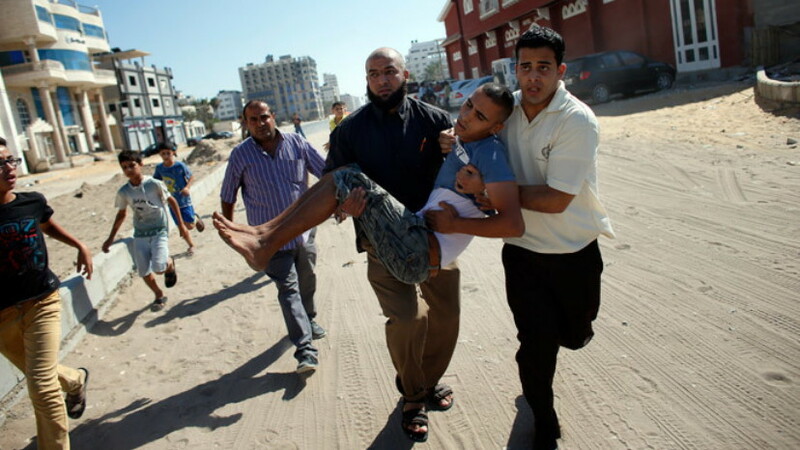 The Day-Glo Salafist and another Hamas operative roughly carried him to his fate. I’m certain that he was he was murdered. 61. 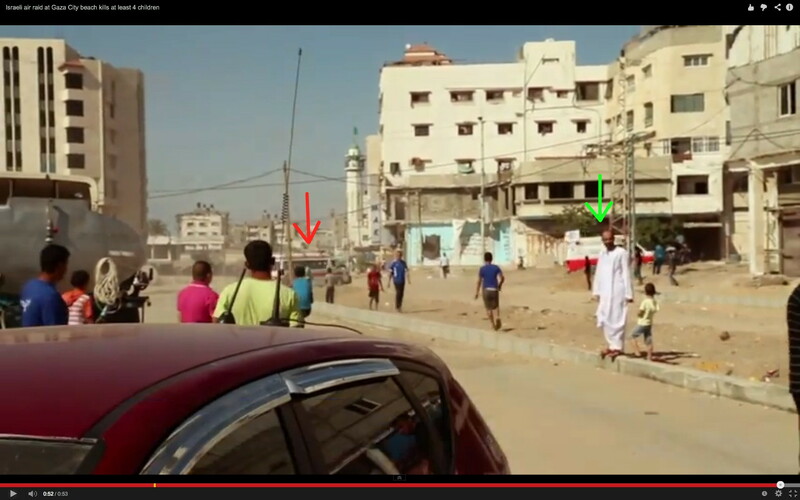 As a Hamas terrorist carried Mohammed Bakr, Hamood Abu Kwaik (red arrow) ran to the pair carrying the injured man. The show took place here, between the al-Andalus Wedding Hall and Restaurant on the left and the Avenue Restaurant and Coffee Shop on the right. 62. 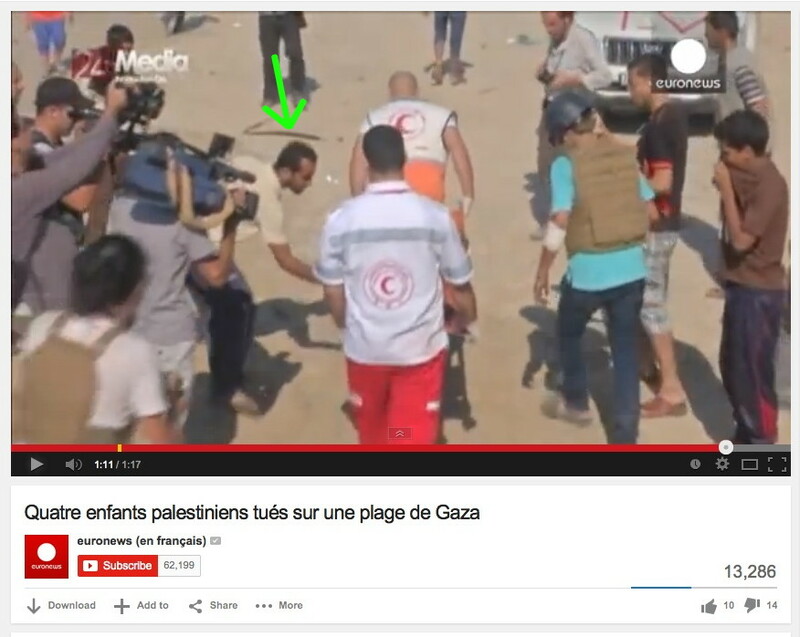 A Hamas “journalist” joined the man carrying Mohammed Bakr. 63. These two gave Mohammed to the Hamas second-in-command, filmed by NBC News. 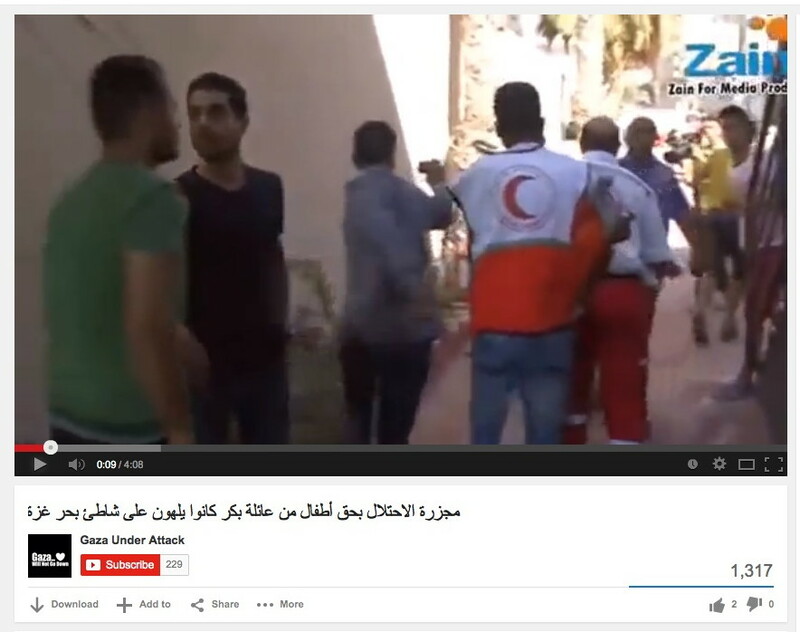 This terrorist—who arranged the first body on the stretcher—took Mohammed Bakr and put him in the ambulance. 64. 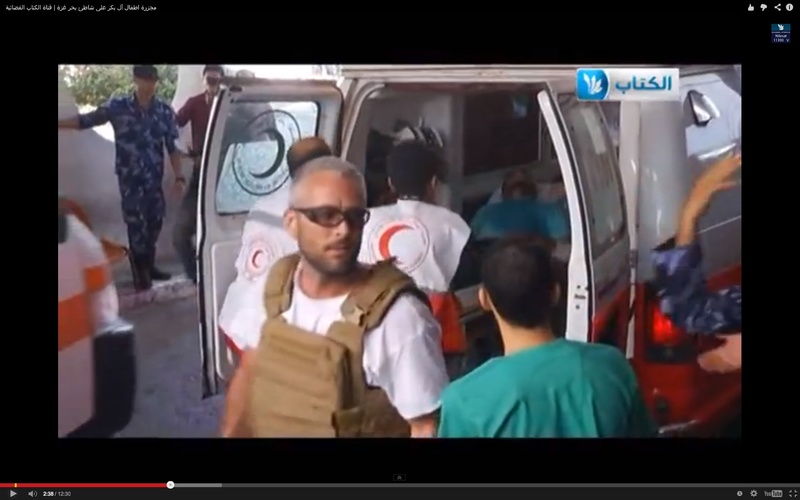 The Hamas second-in-command and the commander of the operation sat in the ambulance to intimidate the paramedics. 65. 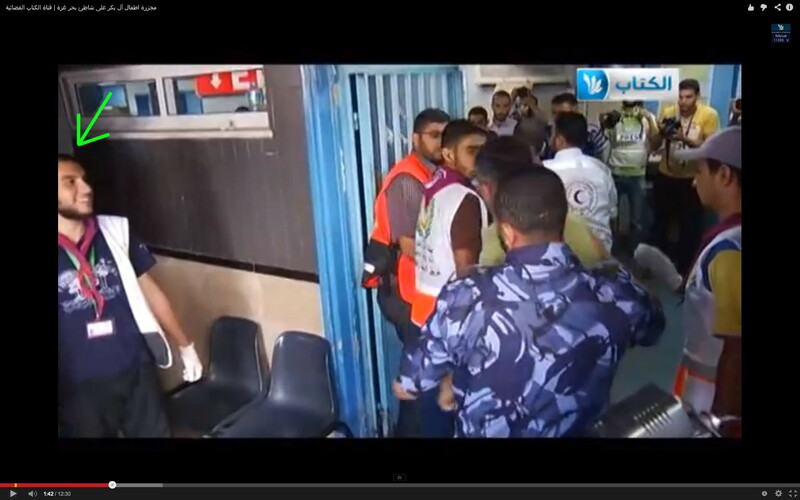 The injured assistant bomber was given to a powerful Hamas terrorist who easily carried him. The Hamas second-in-command and the commander got out of the ambulance, and the injured man was hoisted in beside Mohammed Bakr. 66. Another ambulance arrived and parked across the street from the ambulance holding Mohammed Bakr and the injured assistant bomb expert. 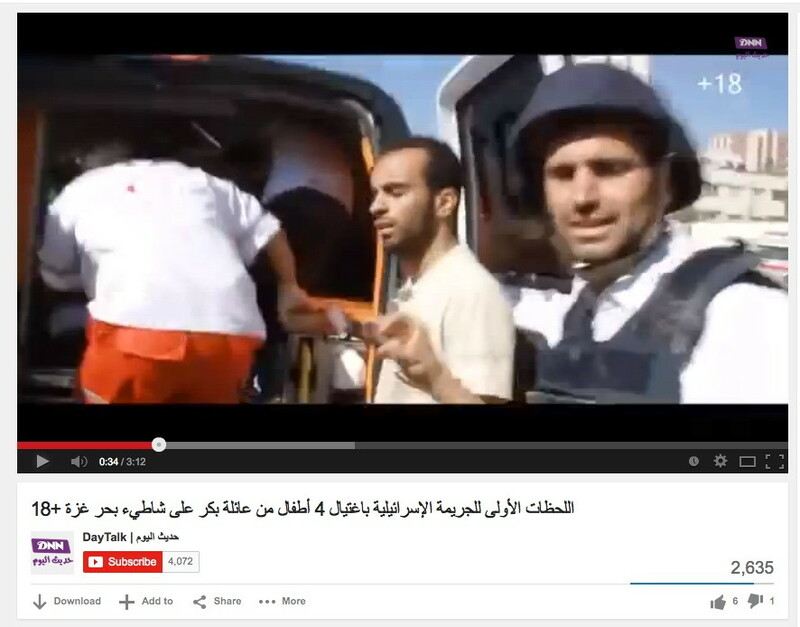 Cameraman Mohamed Jabaly filmed the injured man being put into the ambulance. The Hamas second-in-command stood guard. 67. 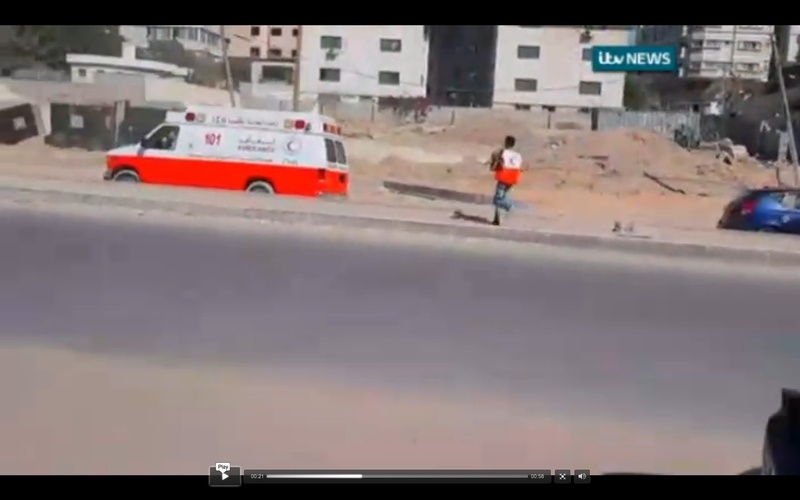 The paramedics from the third ambulance headed toward the beach, guided by Hamas operatives who filmed them. 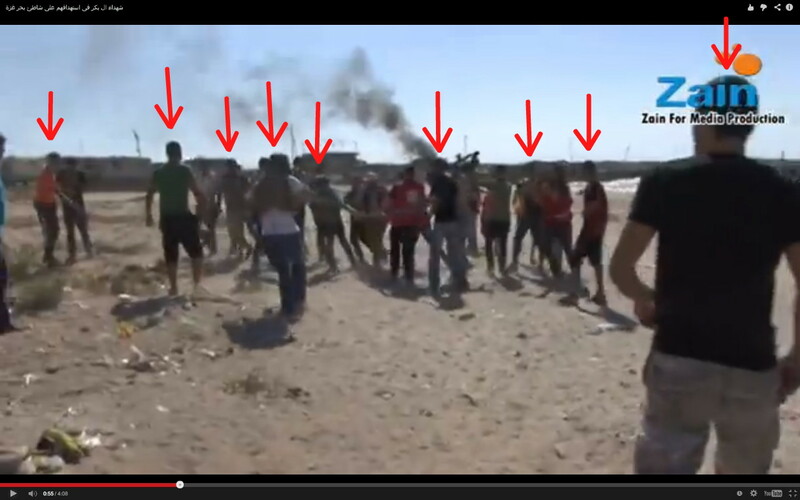 As they collected Ahed and Zakaria Bakr (horrible video here), they were surrounded by Hamas terrorists and Tyler Hicks. All published footage of the recovery of Ahed and Zakaria Bakr had been edited to conceal the exploded body of the dead Hamas bomb expert. 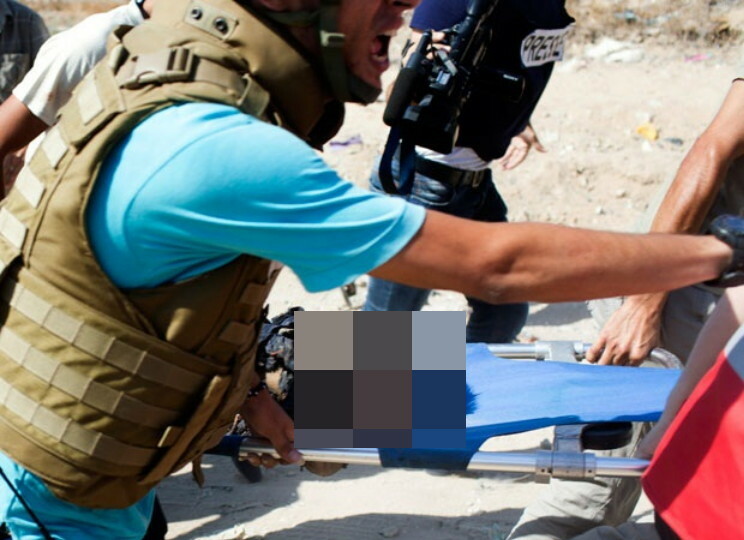 However, raw footage purchased from a Palestinian cameraman shows a corpse wearing body armor. The head, arms, and trousers were blown off. 68. 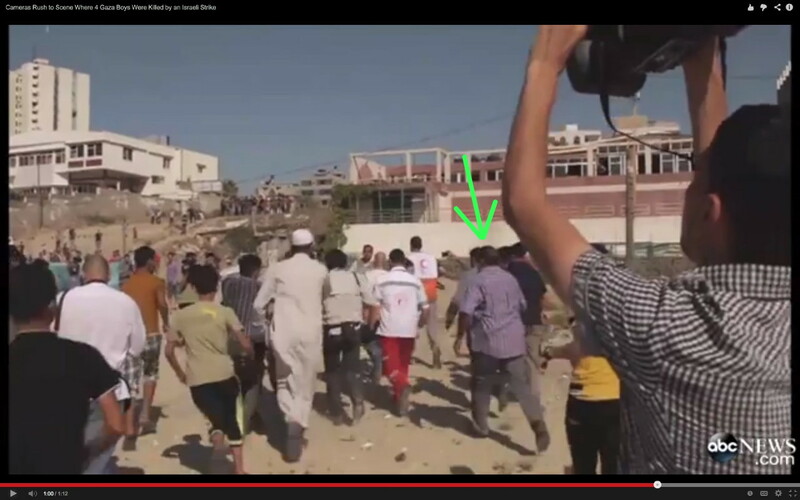 The stretcher bearers ran past the Hamas commander in the purple shirt. He supervised every step of the operation. 69. The stretcher bearers carried the two dead boys up the incline. In front was the Hamas terrorist who shooed he paramedics away from the Beach Hotel; the green arrow marks Hamood Abu Kwaik. 70. 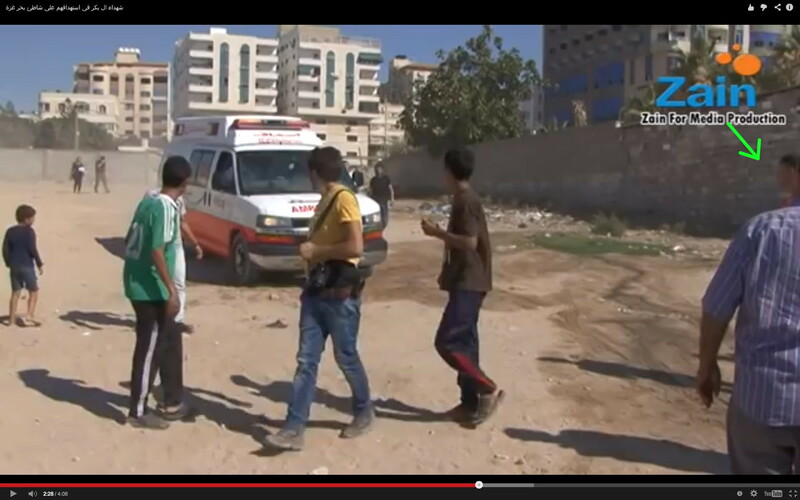 The two dead boys were loaded into the ambulance, Hamas terrorists making sure everything ran smoothly. 71. When Ahed Bakr was first loaded onto the stretcher, his feet were pointing upward, and they were not on Zakaria’s head. However, in the ambulance, his feet were pointing downward, and they were on Zakaria’s head. Ahed’s body was turned over after it was put on the stretcher. 72. 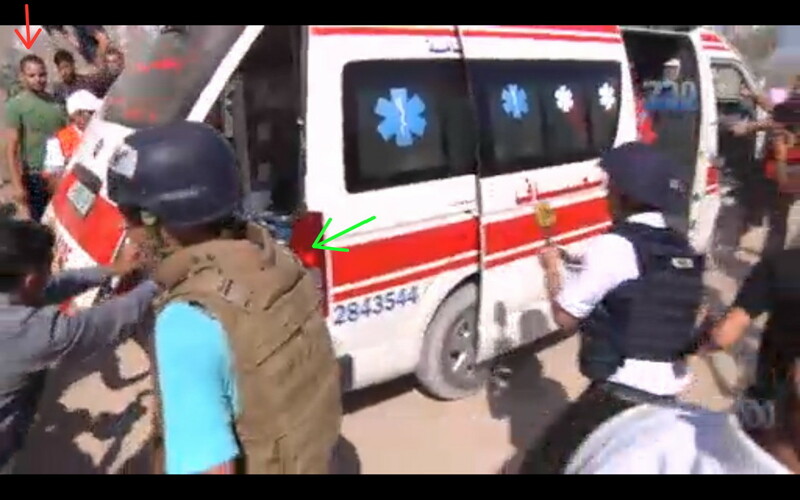 The ambulance (red arrow) then drove to the al-Deira Hotel, where it joined the ambulance carrying Hamad and Motasem-Muntaser Bakr (green arrow). They drove to al-Shifa Hospital together. 73. 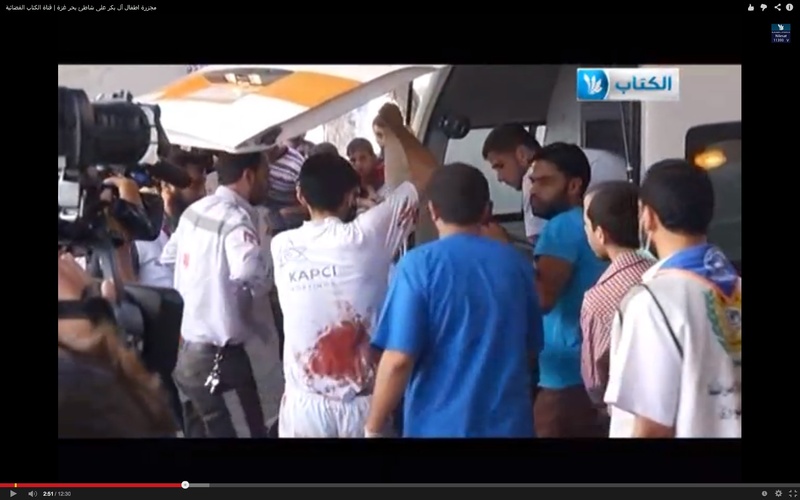 At al-Shifa Hospital, the ambulance carrying Hamad and Motasem-Muntaser Bakr arrived first. 74. 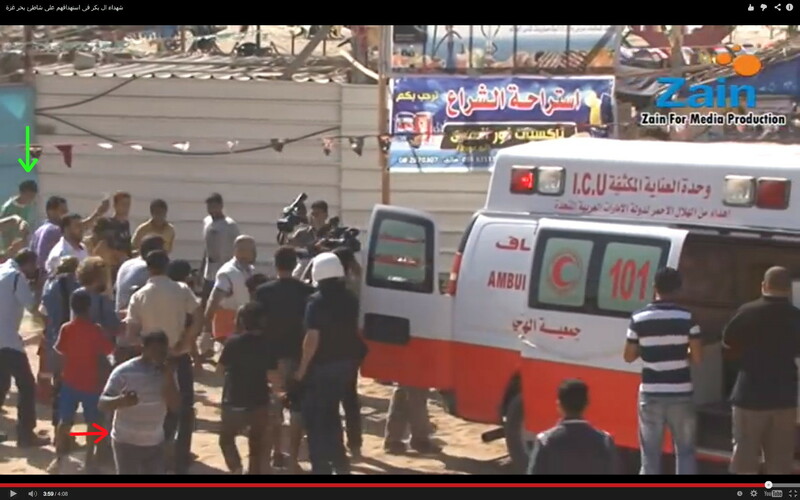 The Ambulance carrying Ahed and Zakaria Bakr arrived seconds later. Hamad Bakr (green arrow) was unloaded as the press took photos and video of Ahed and Zakaria Bakr being rushed into the hospital. 75. 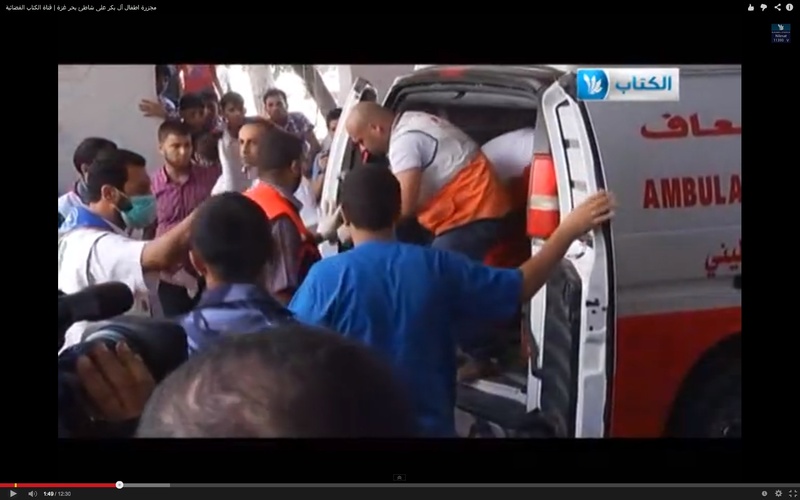 The ambulance carrying Mohammed Bakr and the injured man arrived. However, the injured man was absent, having already been murdered. The corpse of Mohammed Bakr had been turned around so that he emerged feet first. This was to make him more photogenic. 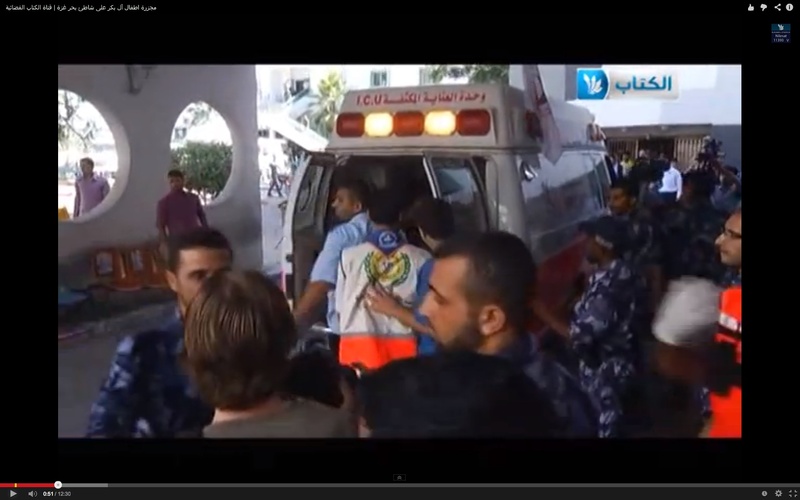 None of the hospital staff nor the Palestinian media seemed upset. 76. The ambulance carrying Ismail Bakr arrived. Although it left the beach first, it stopped somewhere to allow the paramedics to enlarge Ismail’s wounds. His injuries didn’t bleed, but the paramedics returned to the ambulance with a stretcher covered in fresh blood. It was Hamood Abu Kwaik, the terrorist who pretended to be a journalist. Now he pretended to be injured or in shock. He was accompanied by New York Times photographer Tyler Hicks. 78. A fifth ambulance brought in a child. 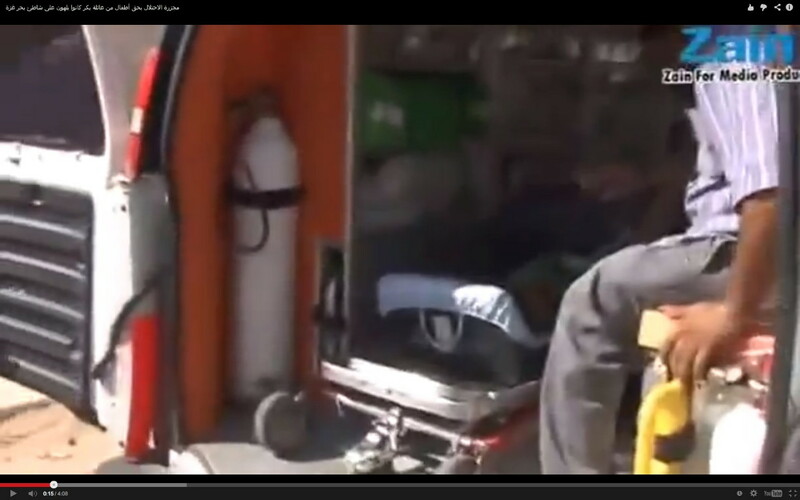 He was obviously dead, because the paramedic was using the Ambu bag or manual resuscitator backwards. 79. 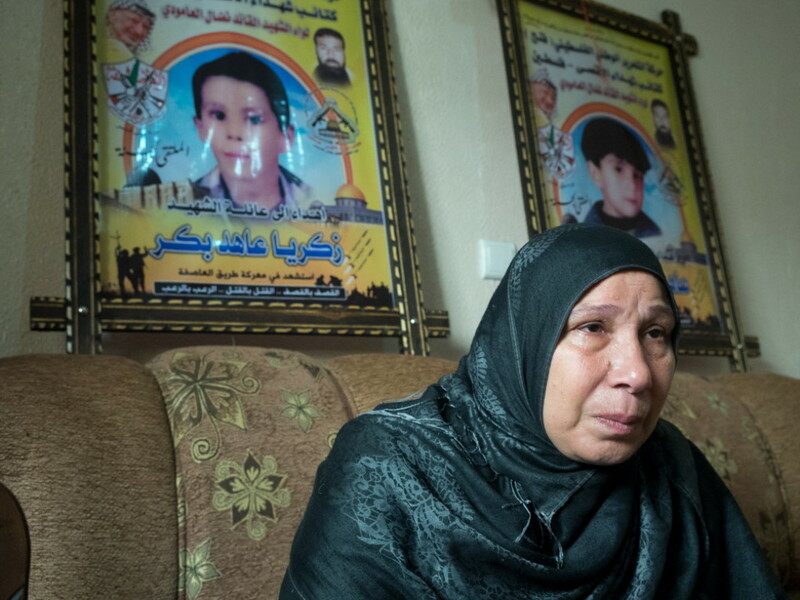 In the hospital, Ahed Bakr was wrapped in a bloody shroud, even though his wounds didn’t bleed. 80. Motasem-Muntaser Bakr gave an interview in which he exhorts “the resistance” to keep fighting. He told two different stories about what happened; every boy claiming to be a survivor had a different version of events, none of which match the eyewitness accounts given by the media. 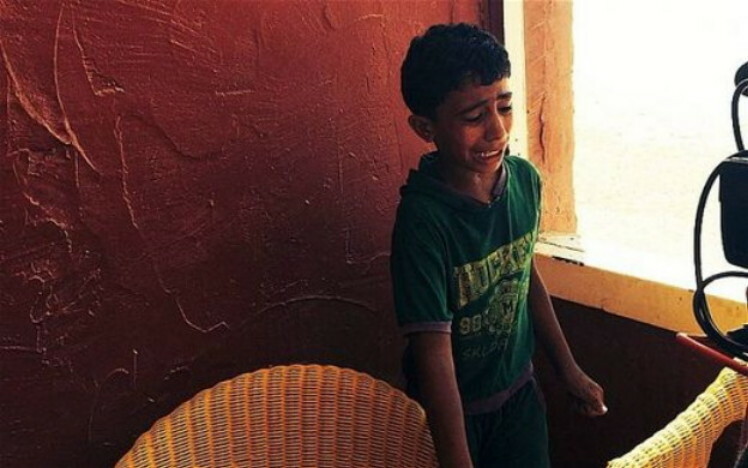 Motassem-Muntasser is a committed terrorist, even though he’s only eleven years old. 81. The steel shipping container in the Hamas compound was scrubbed clean of soot and evidence, and the fake wall was removed. This was the end of Operation Four Little Martyrs. 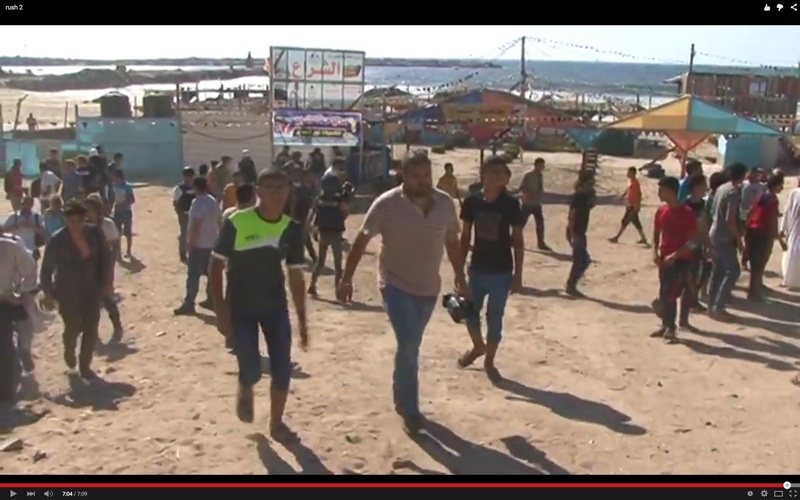 Here is the Hamas team, not counting men on cellphones who may have been bystanders. 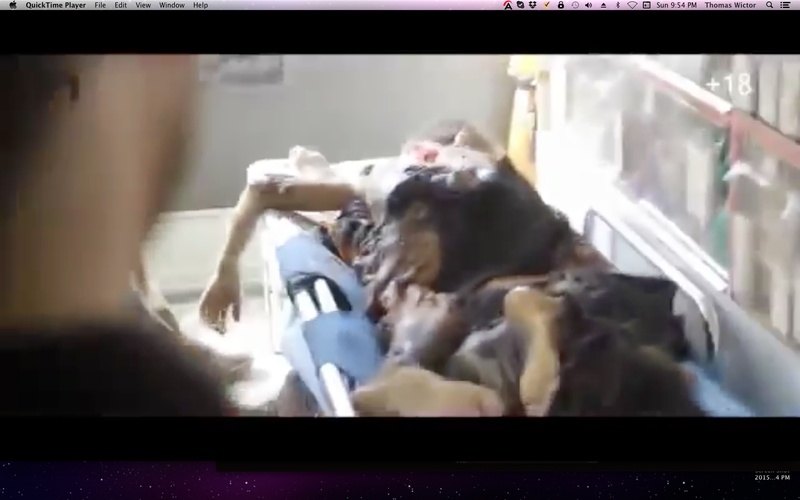 Every individual was photographed or filmed directly participating in the operation. It’s clear that the western media colluded with Hamas, because cameramen filmed much of the playacting from the roof of the al-Ghifari Tower. Here’s NBC’s shot of the beach before the bodies were carried to the ambulance. All the western journalists had left the area. 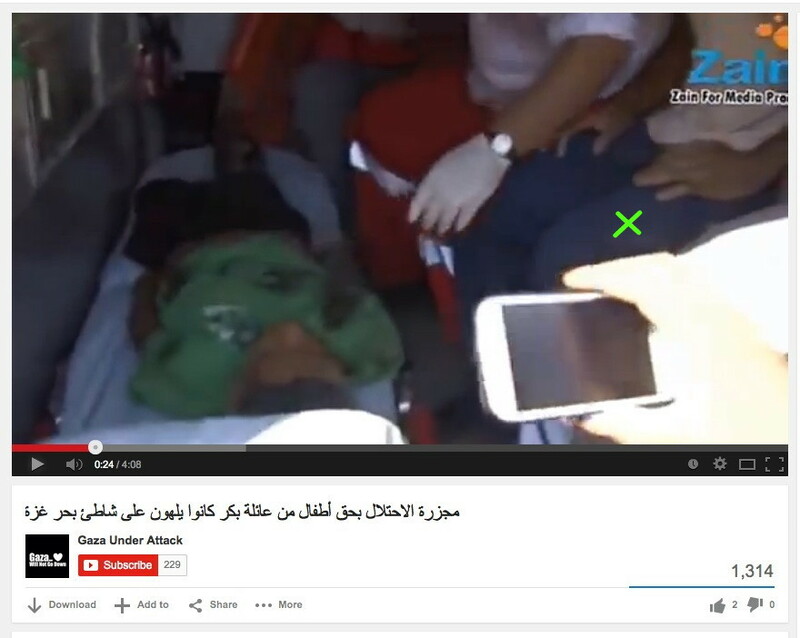 Zakaria Bakr’s body appears to be present, but Mohammed Bakr is clearly not there. Did the NBC crew stop filming at any time, or did it capture the entire farce? Al-Jazeera reporter Stefanie Dekker photographed the paramedics and journalists carrying Ismail Bakr from the police post right past the place where the three other bodies were later found. Do you think she doesn’t know what really happened? What else did she photograph? Liseron Boudoul spent the whole day with the Hamas commander of the operation. She’s a co-conspirator. That’s the only word that describes her. 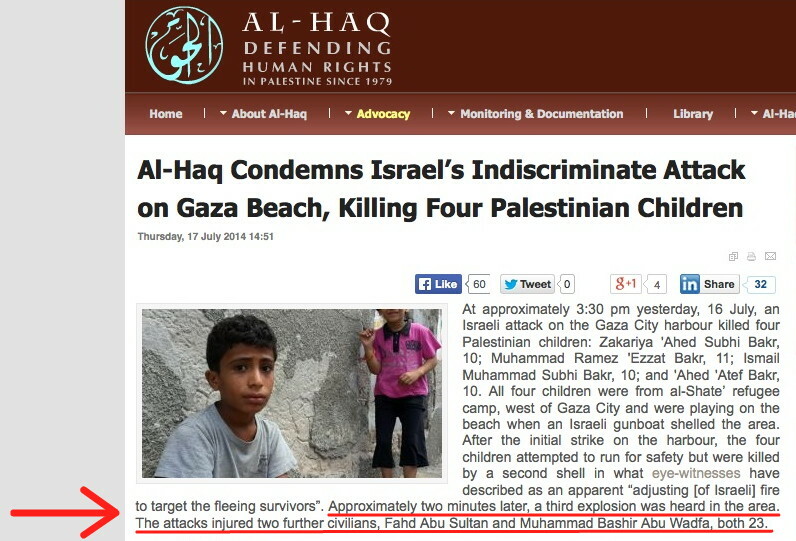 She saw everything Hamas did, yet she reported that Israel had killed the Bakr boys. Tyler Hicks is also a co-conspirator. He lied about what he saw, and he was present when Hamas had to improvise after the bomb expert accidentally exploded himself. NBC News was told to set up its camera in the al-Deira Hotel, where it caught the sound of the first IED exploding. 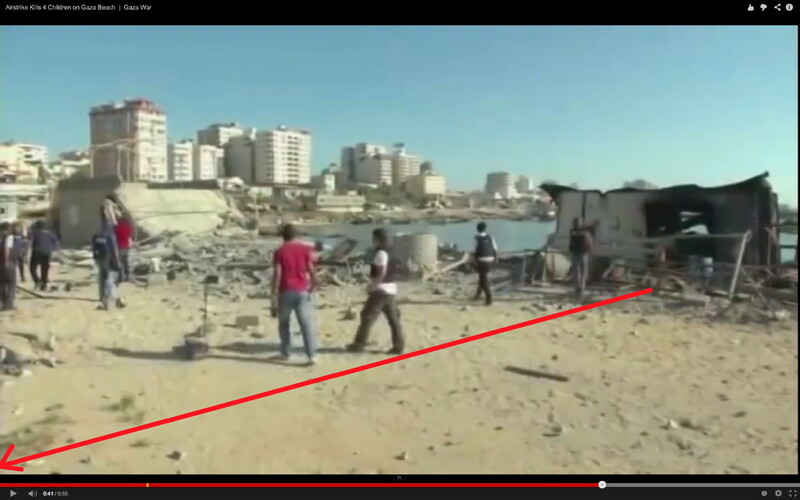 Why didn’t we see the impact of the missile on the police post (red arrow)? I’ll tell you why. Because right in front of the post is the place where the four decoys hid. 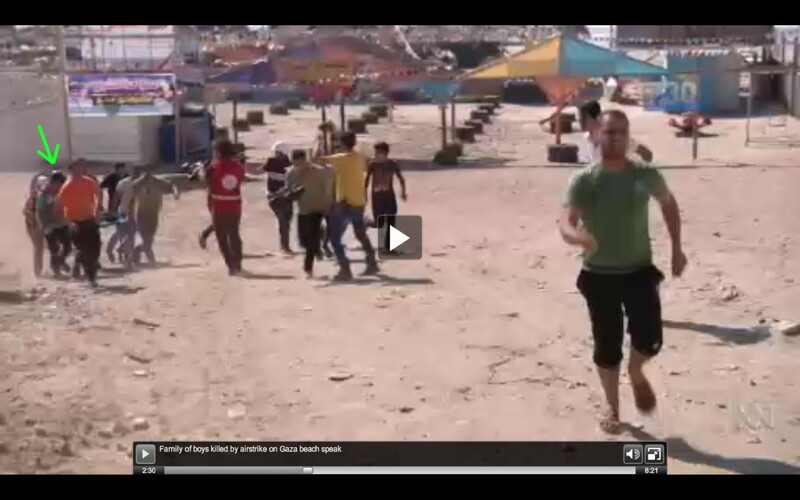 Here’s Motasem-Muntaser Bakr running while holding his pre-broken arm. NBC filmed the decoys emerging from their lair, but they suppressed the video. Finally, why didn’t a single photographer or videographer in the al-Deira Hotel take photos or video of four or five or six males running toward them, screaming, as an Israeli munition landed behind them? The press is covering up for Hamas because the narrative is that Israel is evil. 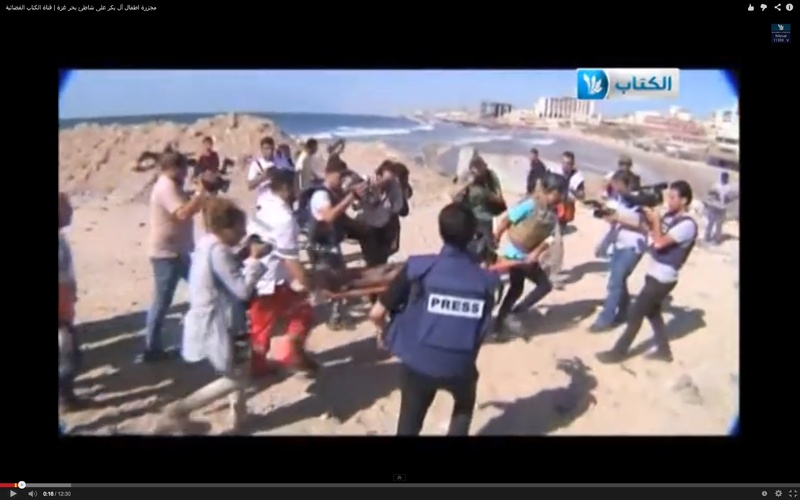 Western journalists helped Hamas pull off Operation Four Little Martyrs. The members of the Fourth Estate tell themselves that they’re “practicing accountability journalism,” “speaking truth to power,” and “standing up for the underdog,” but the reality is that they’ve motivated by medieval Jew-hate—nothing more or less. “Goons”? This from an unfathomably immoral man who’s protecting child-murderers in order to destroy people who don’t commit murders. 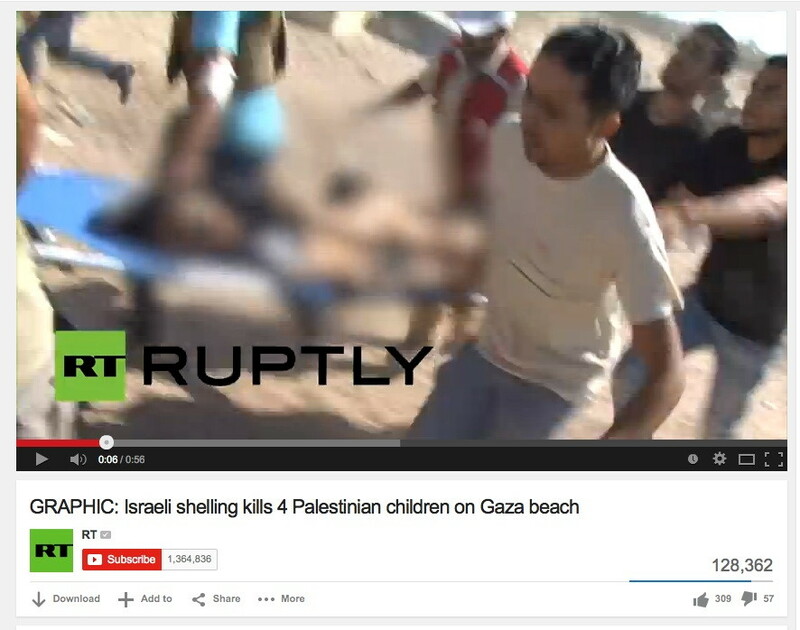 Hamas confirmed that the Gaza deaths were part of a military operation. They commemorated each boy with a mujahid poster. The terrorists don’t honor civilians with mujahid posters. Only martyrs killed while TAKING PART in a military operation are given these posters. And a mujahid can be involuntary or unknowing. He doesn’t have to be aware that he’s going to die. If I were running the Israeli government, I’d yank the credentials of every media outlet in the world. They’re enemies of Israel, as dangerous as Hamas, the al-Aqsa Martyrs Brigade, Palestinian Islamic Jihad, and Hezbollah. Click here for the archives of Operation Four Little Martyrs. 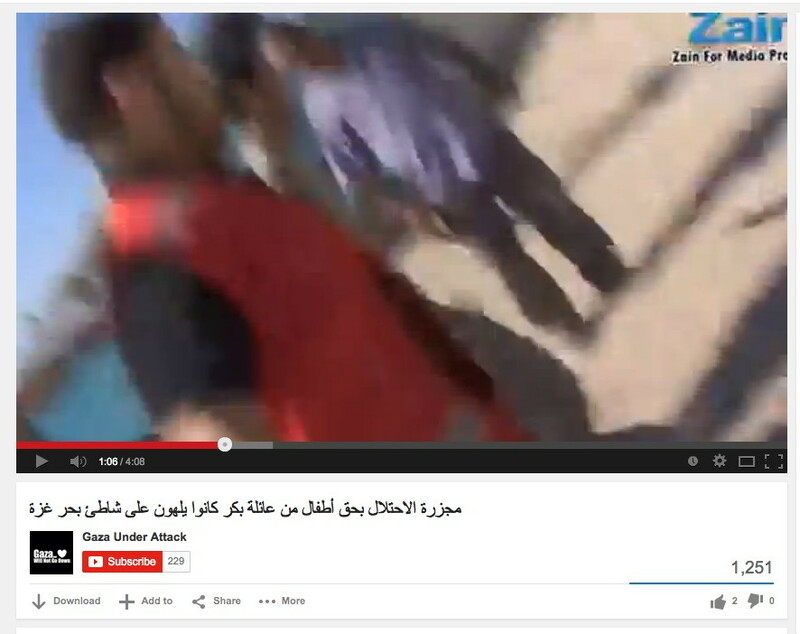 Why did Hamas threaten journalists in Gaza? This article viewed 13642 times.